This is our final night in Solo, and at this beautiful hotel. At last I finally can get a real and proper sleep! 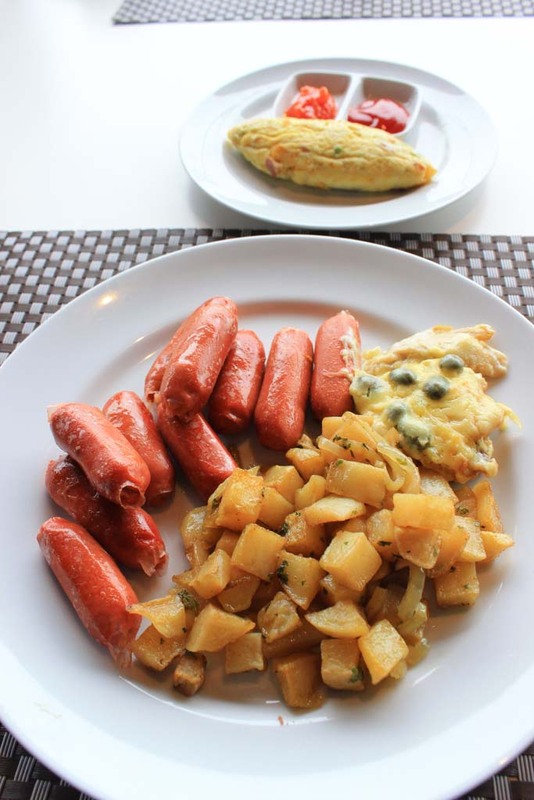 After dressing up a bit, I went down to the 5th floor to have a breakfast. Upon entering the restaurant, I found that both Waktong and Hafizul have already been in the restaurant. 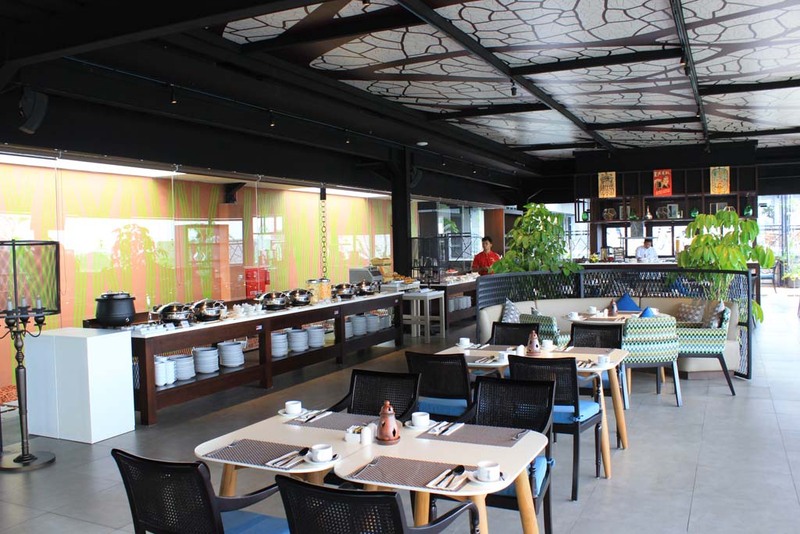 But what surprises us is the fact that we are the only customers in the restaurant for today! It seemed that last night we were the only guests in the hotel too! 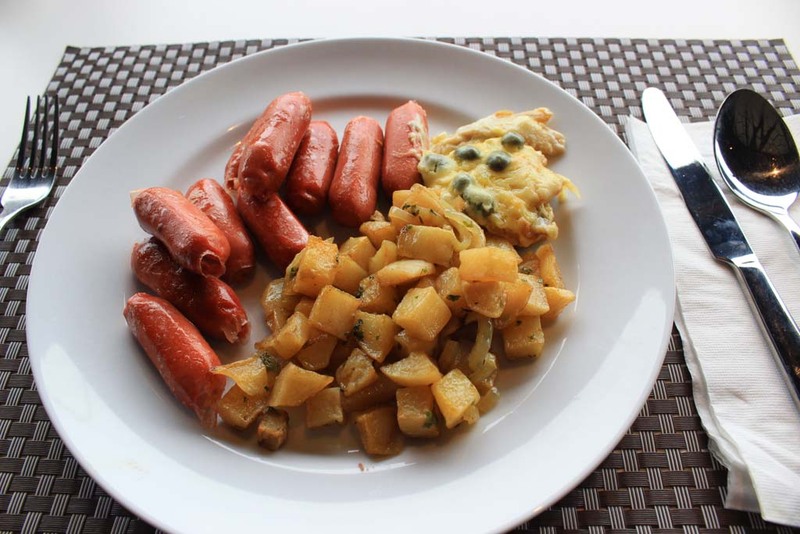 I took my breakfast which consist of stir fried potatoes and grilled sausages. 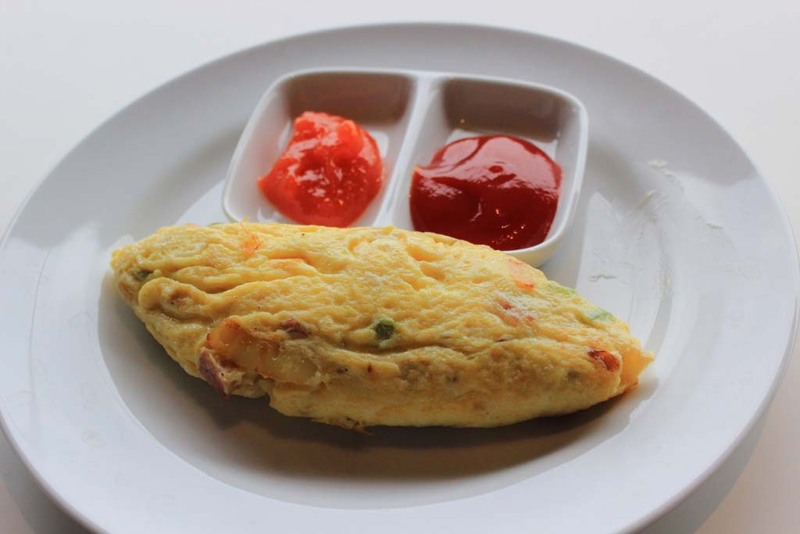 I also ordered omelet as side dish too. 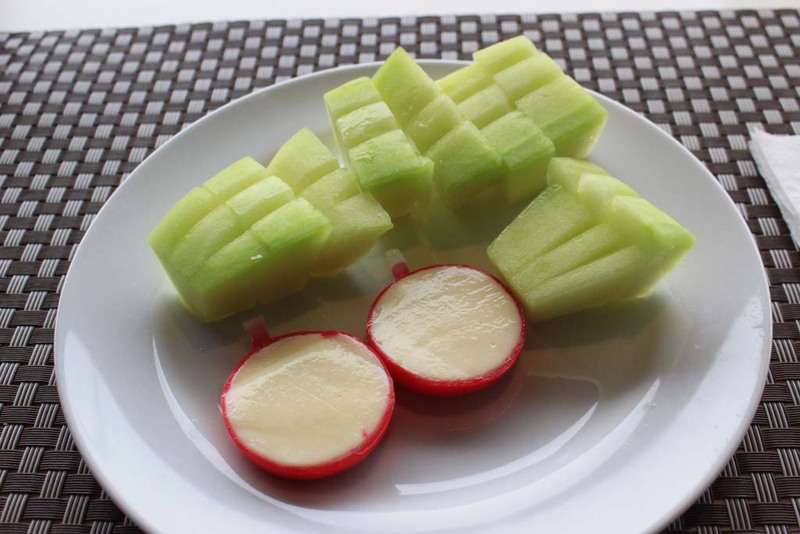 And as a dessert, I took some fruits and cheeses. After finishing our breakfast, we head back to our room to pack our belongings in preparation for check out. I also had shower too, before heading out. 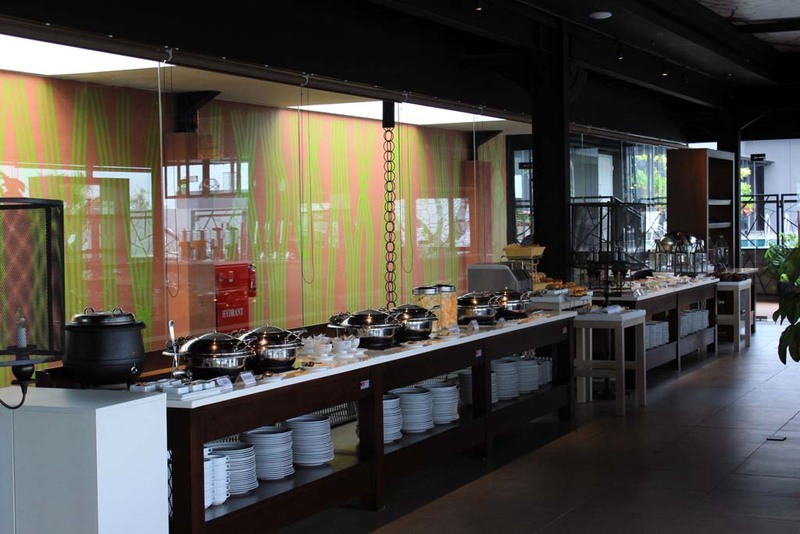 Once we have prepared everything, we went down to the lobby to settle the bill and check out from the hotel. No additional expenses were incurred, and we are good to go. 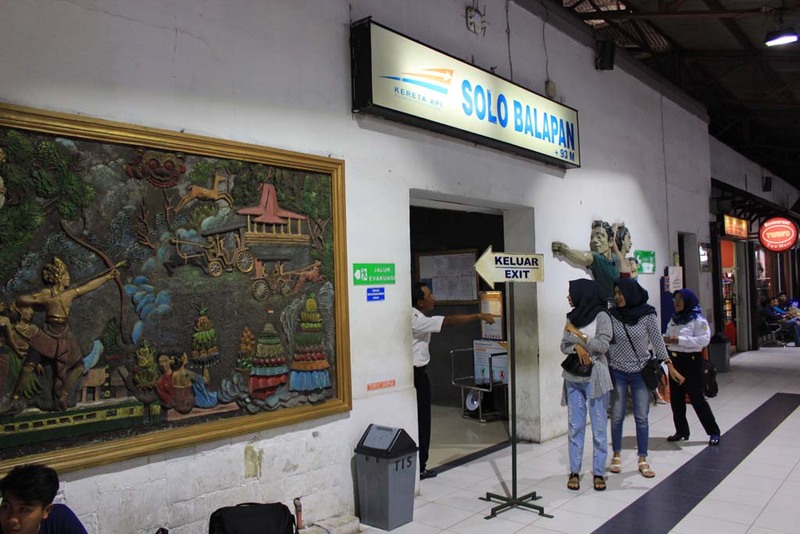 We have additional itinerary for today, and also since our return train to Surabaya depart in late afternoon, we decided to drop our bags here, and will collect them again after returning back from Wonogiri. 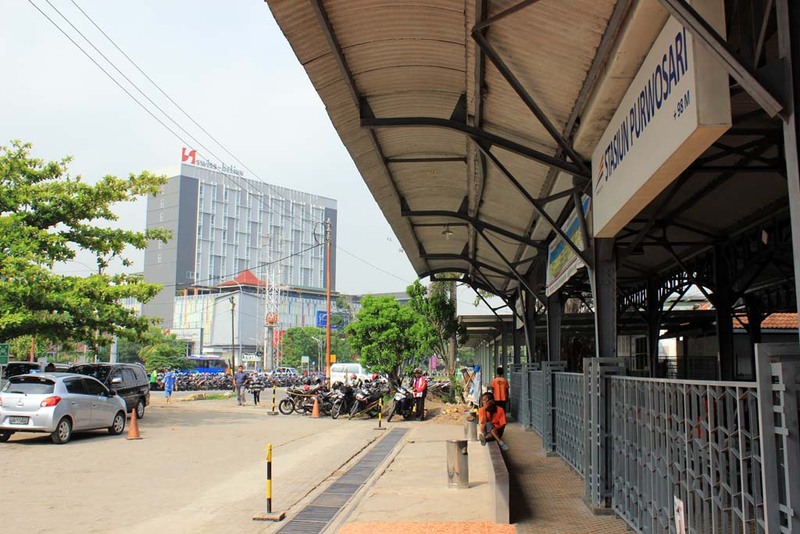 Soon, we head to Solo Purwosari station which is located very near to the hotel. 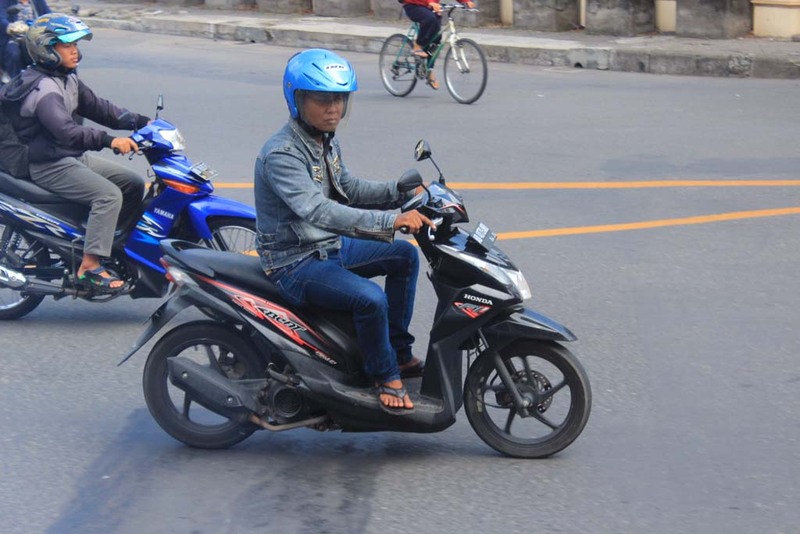 I have to admit that the pavement is very wide, and amazingly no motorcycles ever intrude it! After a few minutes walking we finally arrive at the station. The station is busy as usual with morning departures. 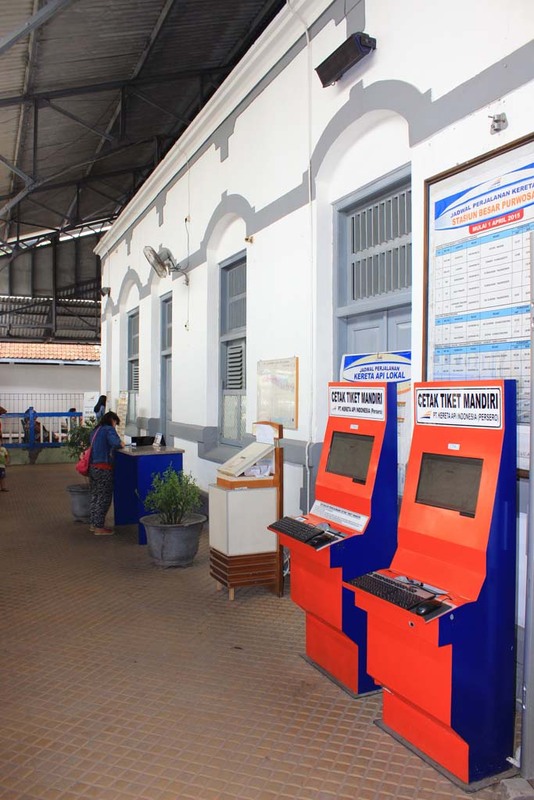 These days, this station is used to cater all economic class trains who arrive and depart from Solo, replacing Solo Jebres station which is located to the east of the city. 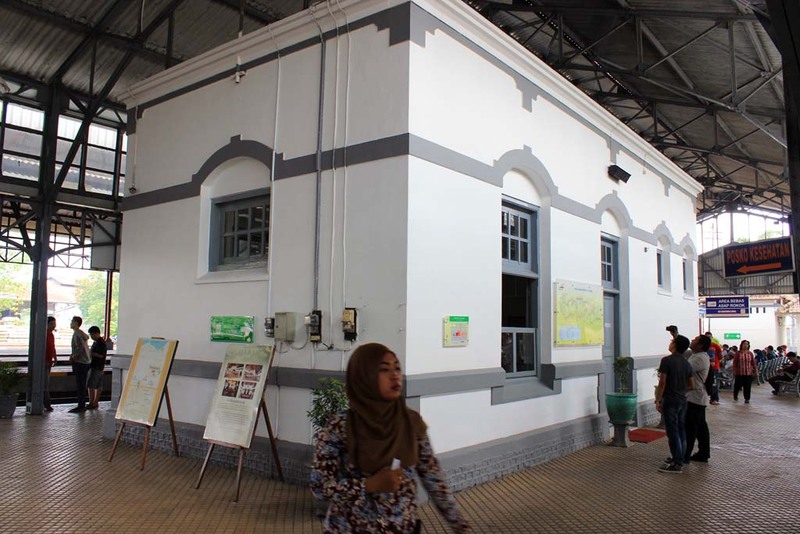 What amazes Waktong and Hafizul is the fact that despite all of the modernization in Indonesian railway, they’re still preserving the old building! 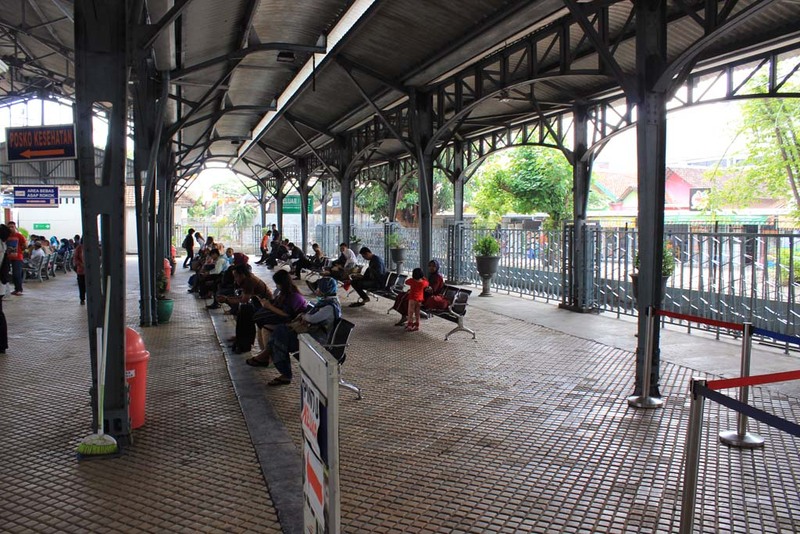 According to Waktong, in Malaysia such thing are rare as the Malaysians often consider old buildings (regardless of their historical value) are outdated and must be replaced with new buildings. 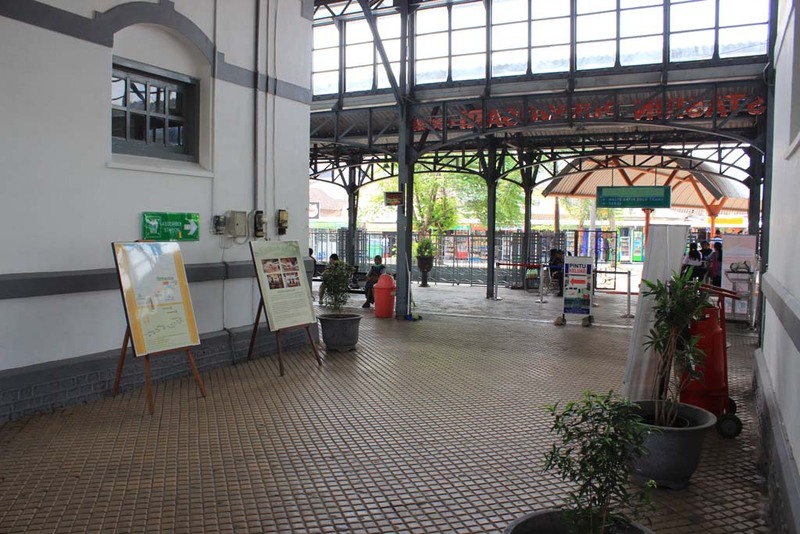 Just near the entrance door, we can see the remains of the original cape gauge platform of this station. 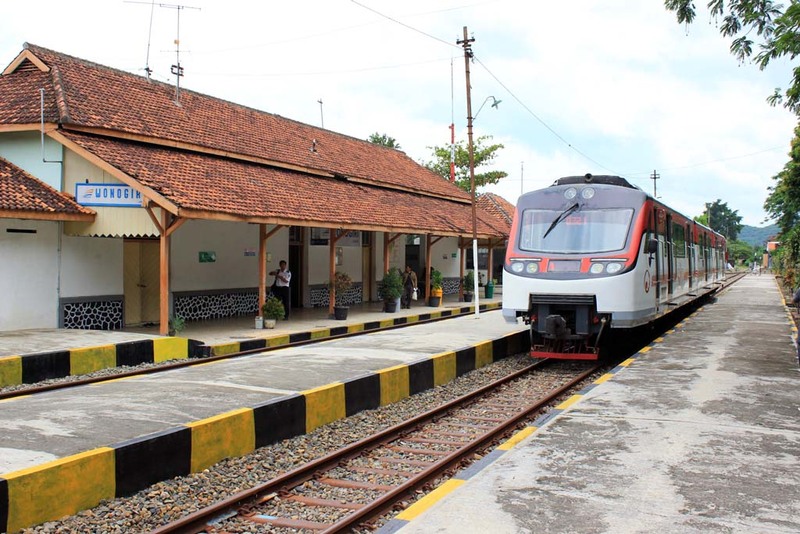 This is where the train to Wonogiri were originally departed, as the tracks on the current platform were once laid to standard gauge. But with the arrival of Japanese, they regauge the track to cape gauge, and lifted this part to be used for Death Railway. 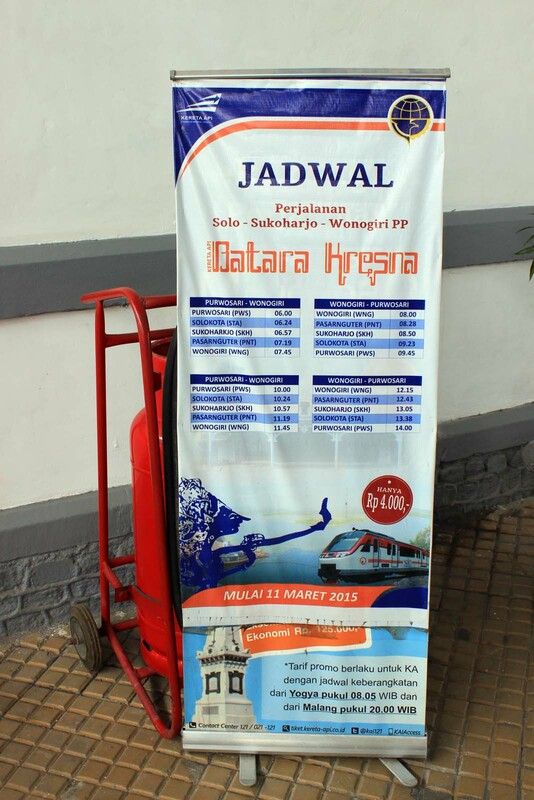 According to the schedule, our train depart at 10.00. As it was almost 10, we entered the platform immediately. It was still quiet in the platform. No trains are here yet. 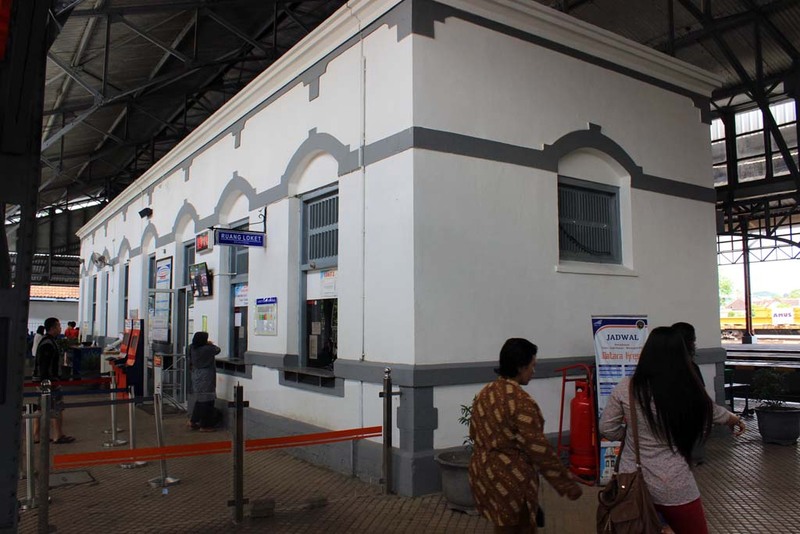 While waiting for the trains, I also spend time by marveling the original Dutch era architecture of this station. 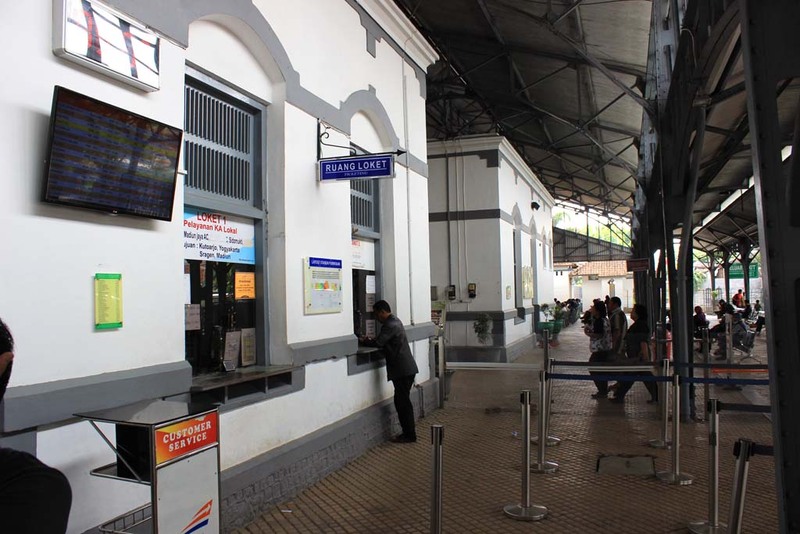 This station share similar architectural style as Ambarawa and Kedungjati station. 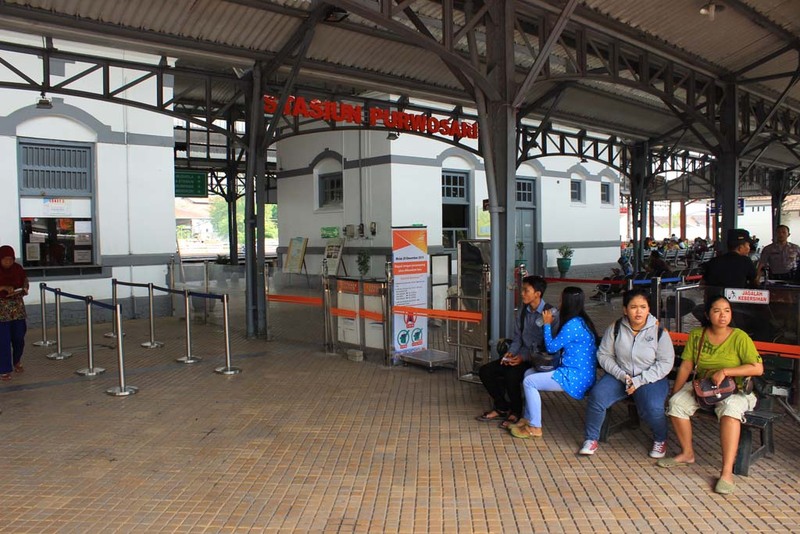 And just like the other 2 stations, this one originally had island platform configuration, before the departure line for Wonogiri branch relocated to the present site during Japanese occupation era. 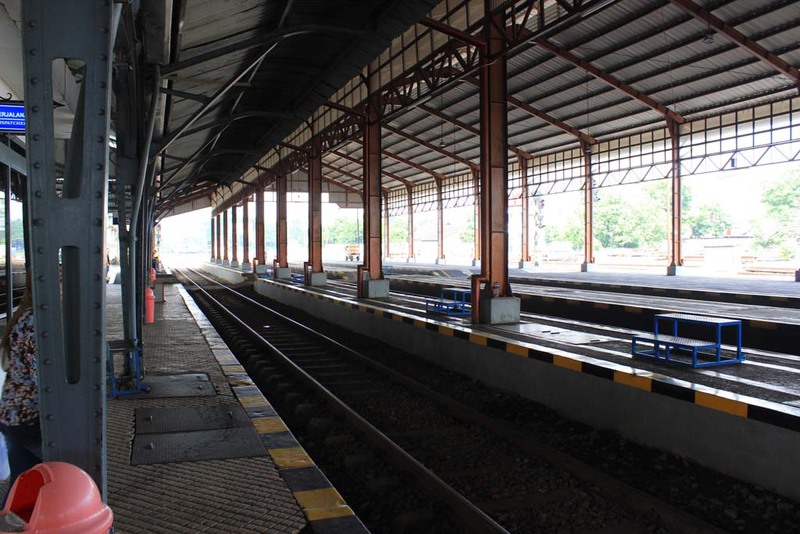 And up until 2008, this station had no platform roof, other than for track no.1. 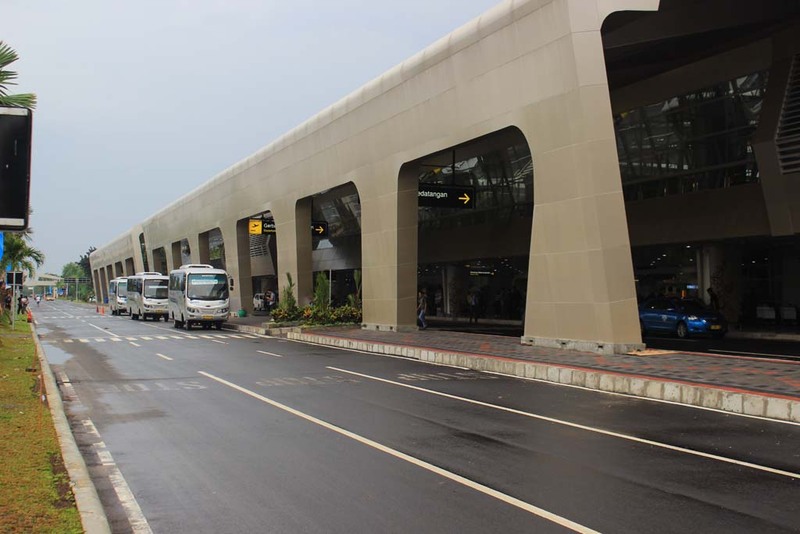 But since then this large additional structure was added for the comfort of passengers. 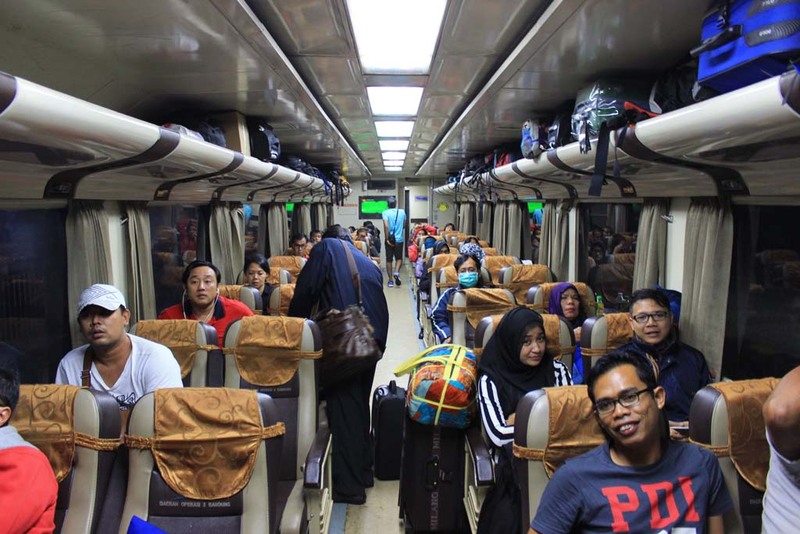 Such as these passengers who wants to board Prambanan Express train to Yogyakarta. 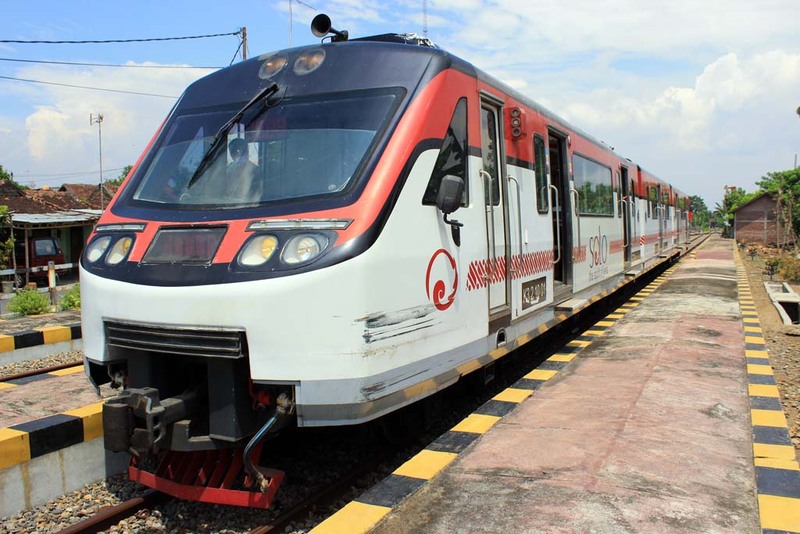 Although officially count as intercity train, Prambanan express DMU service does actually act as a commuter train for Solonese who work in Yogyakarta or vica versa. 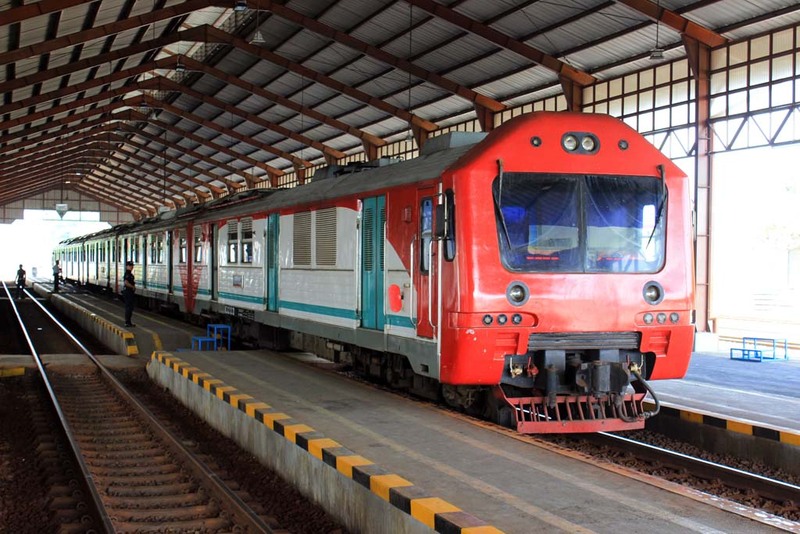 Originally conceived as local trains served by Glossing und Sholler built DMU in 1960s, the Prambanan express train has since evolved into a popular commuter train service in here. 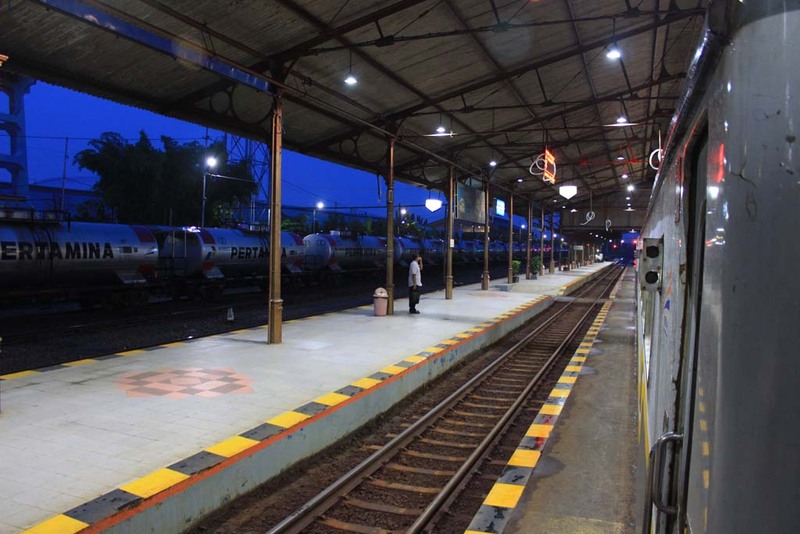 There is even a firm plan to electrify the service too. 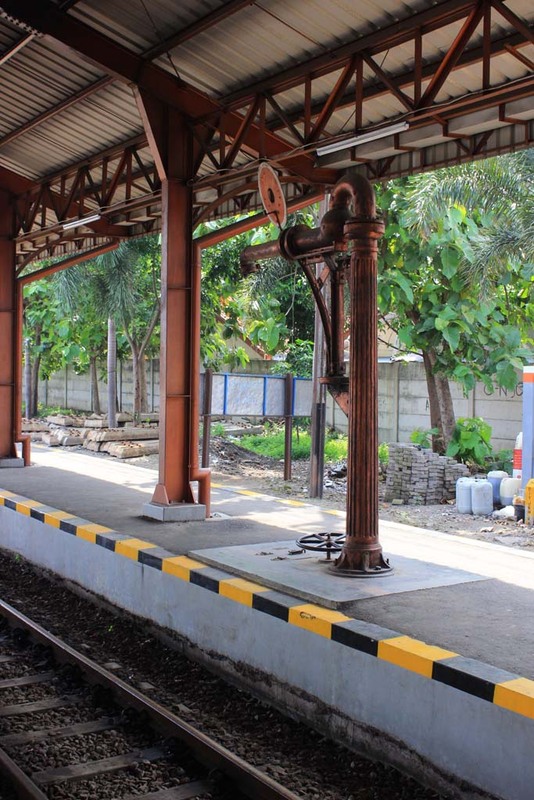 At one corner of the station is a water crane used to replenish the steam locomotive used for Sepur Kluthuk Jaladara tourist train. 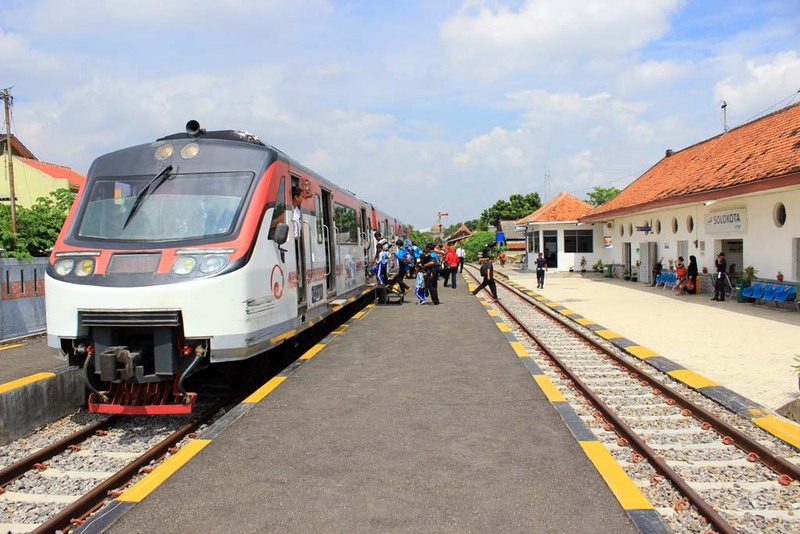 Solo is currently the only place in Indonesia where real steam locomotive running alongside modern trains. 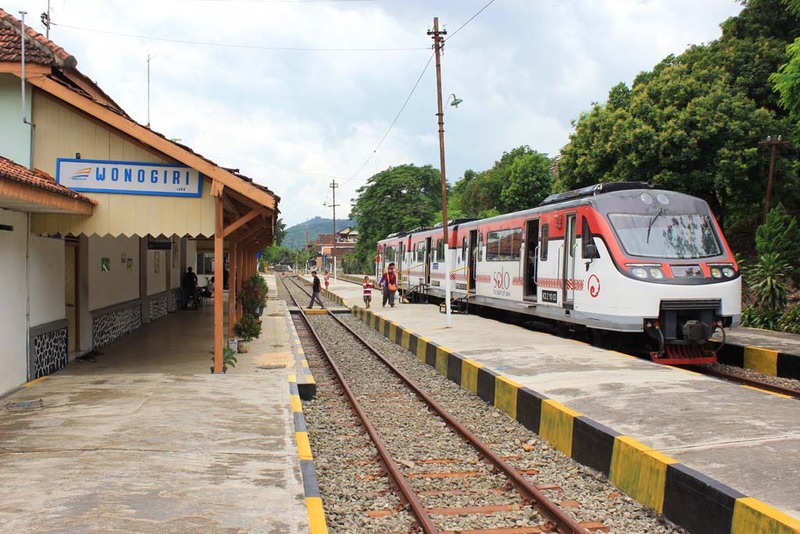 The ones in Ambarawa ran at isolated railway line, which is not yet reconnected with the mainline. The station is getting more crowded now, as more passengers arriving. 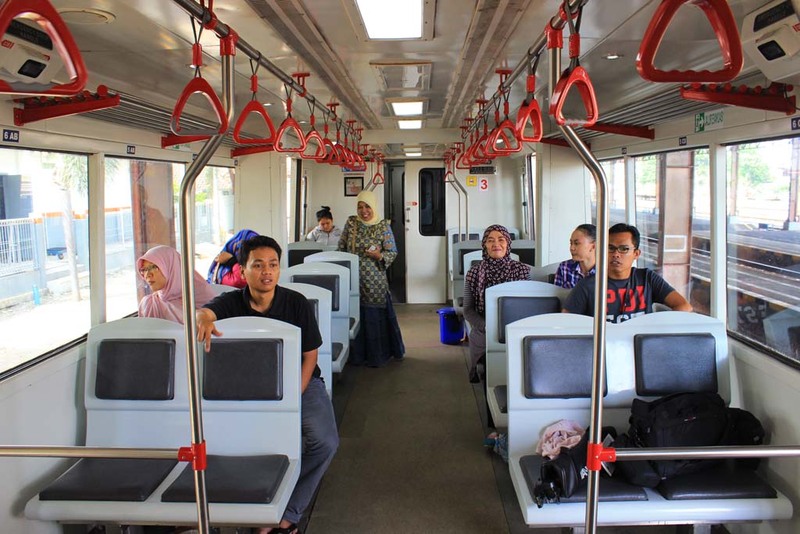 Only a few of them took the train to Wonogiri. 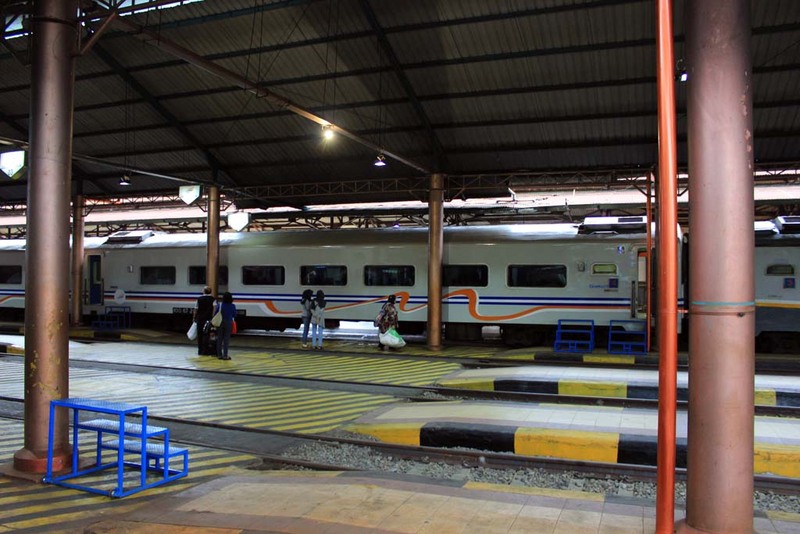 Most traveling with other trains either to Surabaya or Purwokerto. 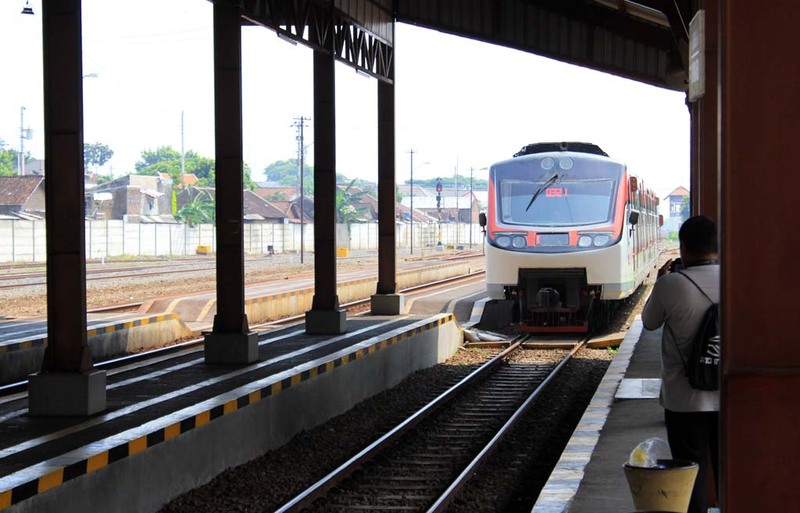 About 10 minutes before our departure time, the Batara Kresna train arrived. We boarded the train, and it was not really crowded inside. Unfortunately, it was rather hot too as the aircon system is not working properly. Me and Hafizul sat on the first coach, just behind the driver’s cab. 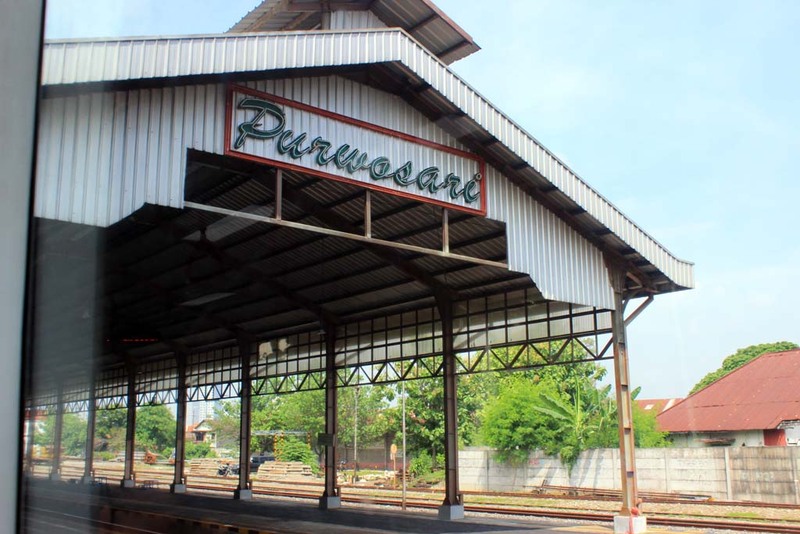 Right at 10’o clock our train departed Solo Purwosari station. 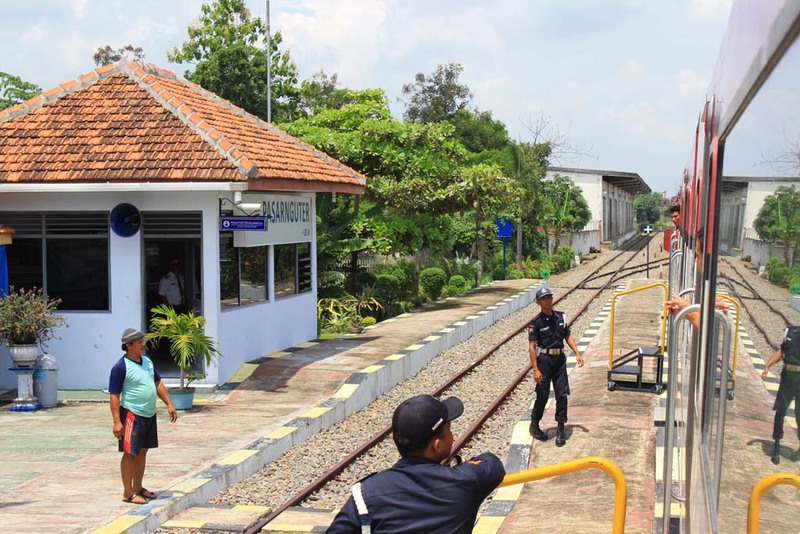 After passing through narrow space, we eventually arrived at the street running section, where our train already drew attention from motorists. 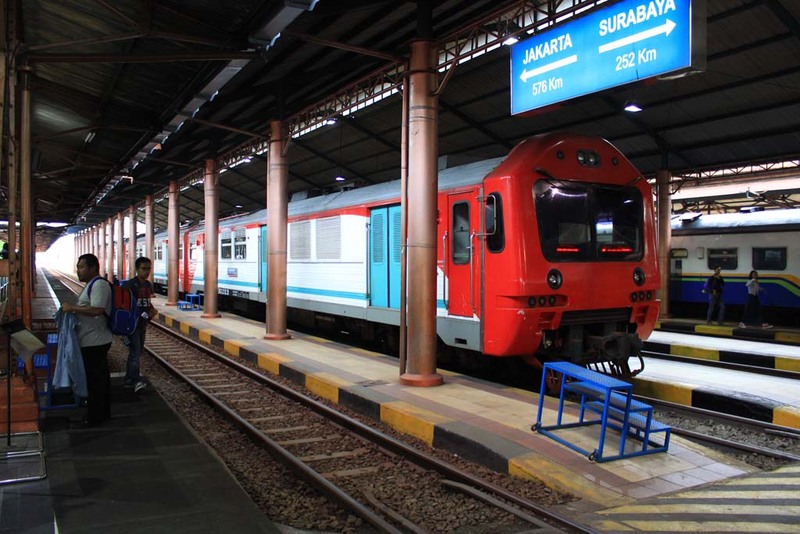 Traveling with this train is also a great way to explore the city, as it is also passing through some landmarks in here, although unfortunately it doesn’t stop at all. But I was told that Sepur Kluthuk Jaladara does make some stop on interesting places. 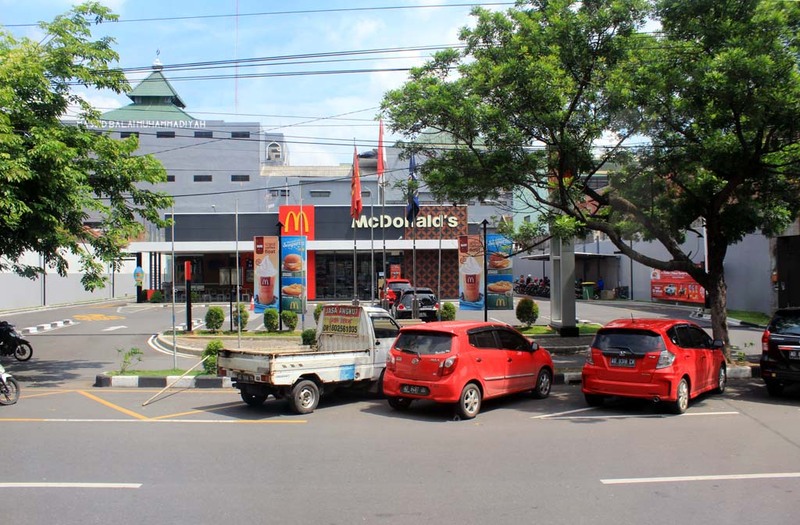 Although the city of Solo has strong traditional Javanese identity, sign of Westernization is already apparent in a form of McD restaurant. 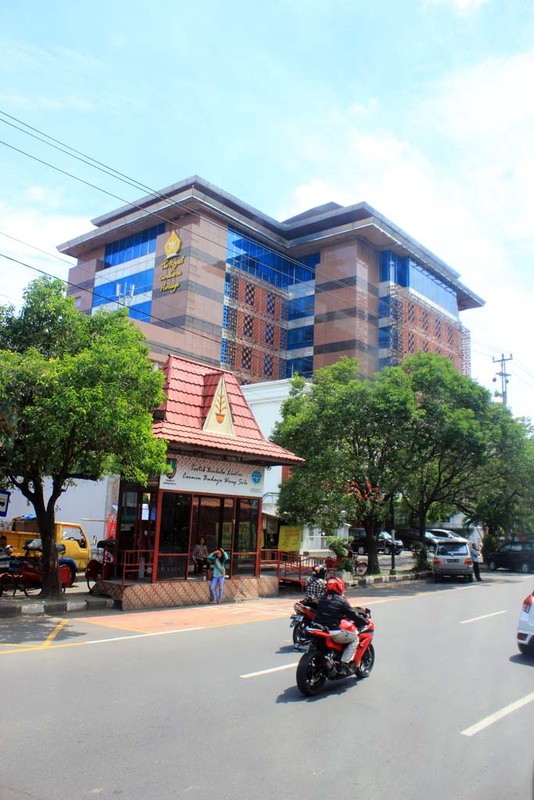 We also pass near The Royal Surakarta Heritage hotel. The hotel building was originally built as a bank. But when the bank went bankrupt, it was taken over by its creditor and converted into a hotel. 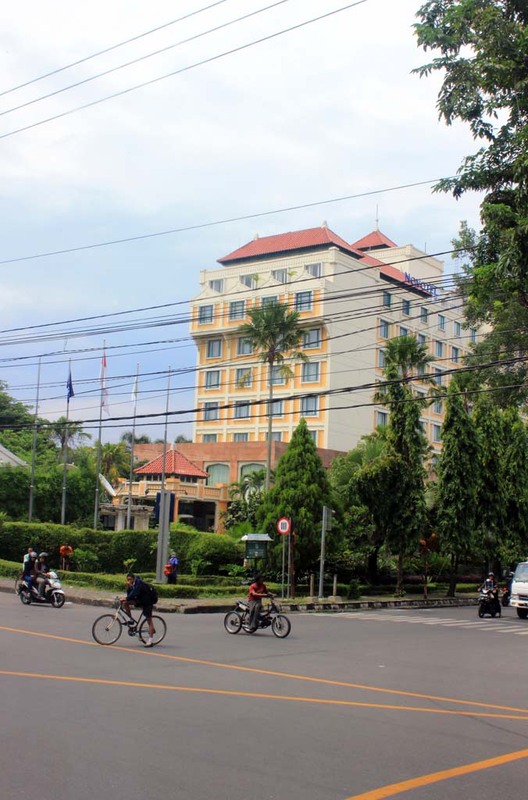 Originally a Best Western hotel chain, but later replaced by Accor group and renamed The Royal Surakarta Heritage. Despite of its “heritage” tag, it is actually a new hotel. 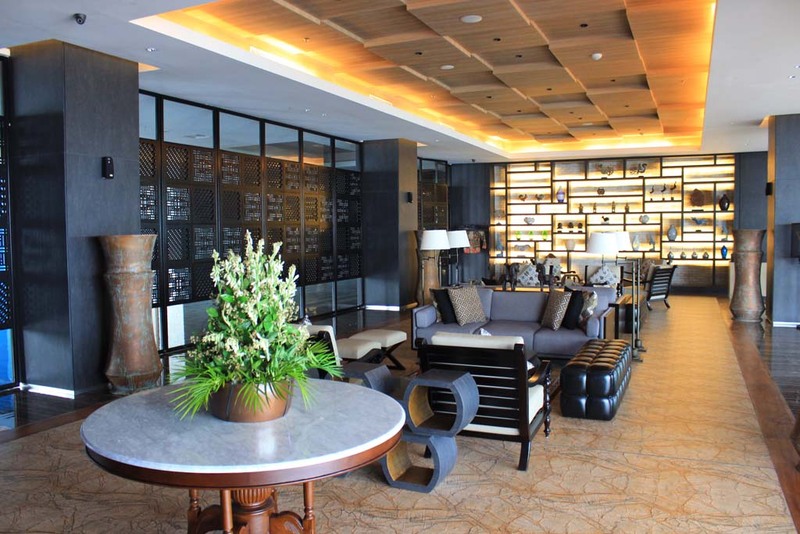 Once the most luxurious hotel in Solo, it has since been overtaken by Alila Solo which offer better service. 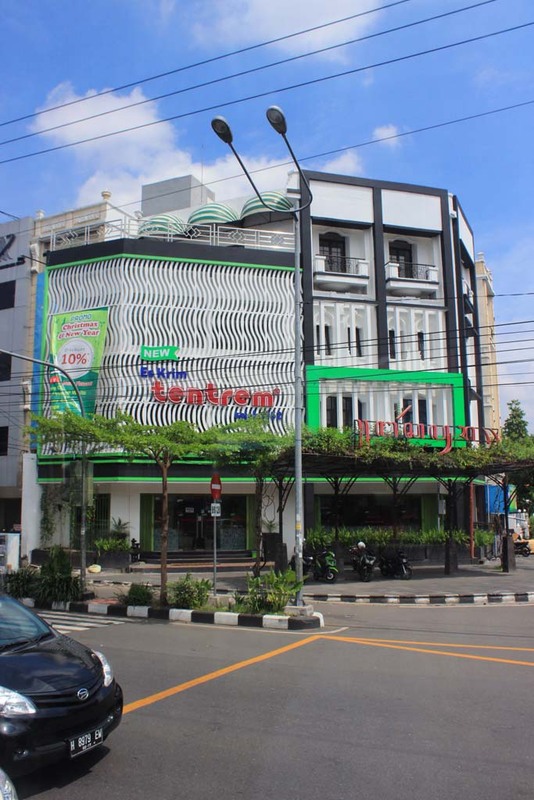 But still, this hotel has some advantage than its rival as it is located very near to the royal palace and downtown area. 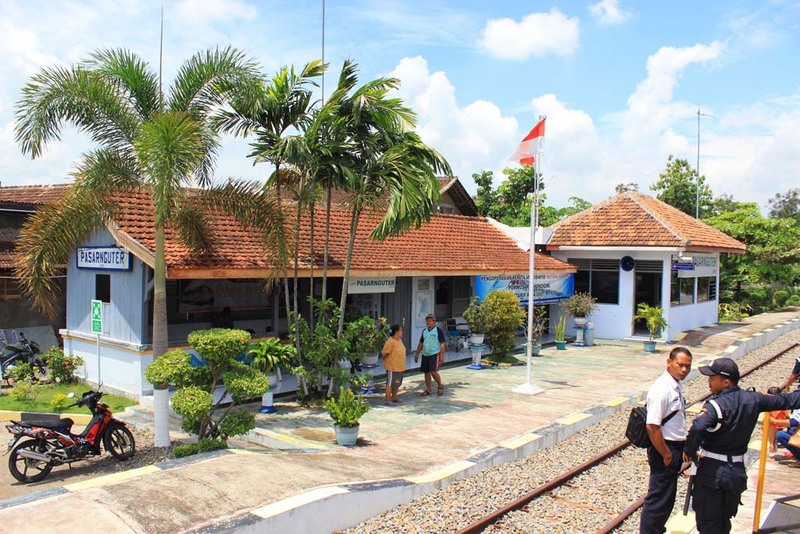 After passing through that hotel and the royal palace, our train eventually exited the street running section before arriving at Solo Kota station. 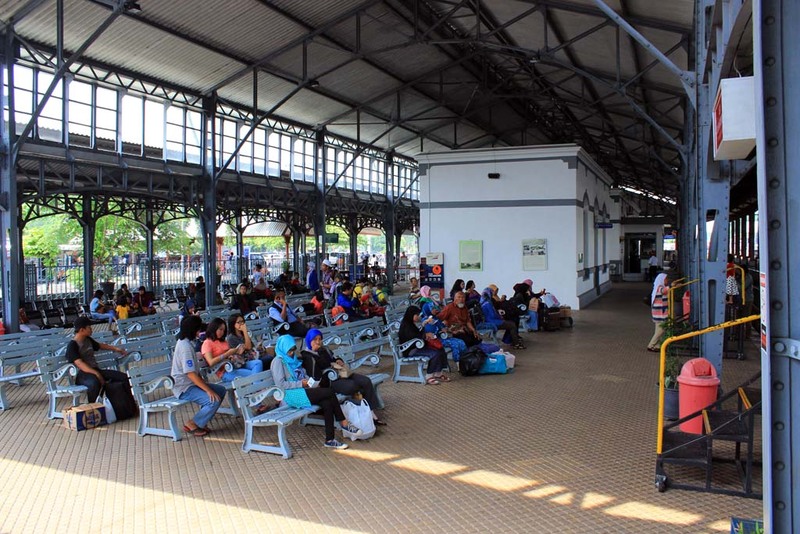 In Solo Kota station, a large number of schoolchildren and their teachers boarded the train. Making the train packed! 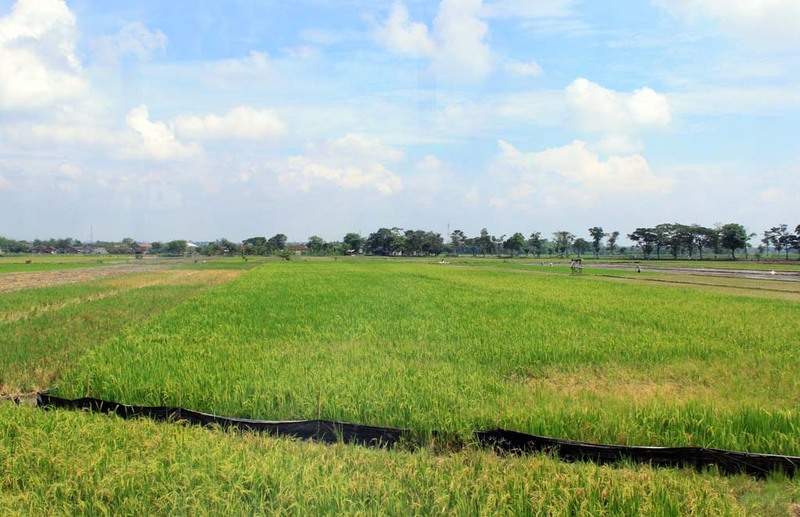 Once we depart Solo Kota station, we crossed the Bengawan Solo Bridge where from there the crowded urban area are replaced by beautiful farmland and rural scenery. 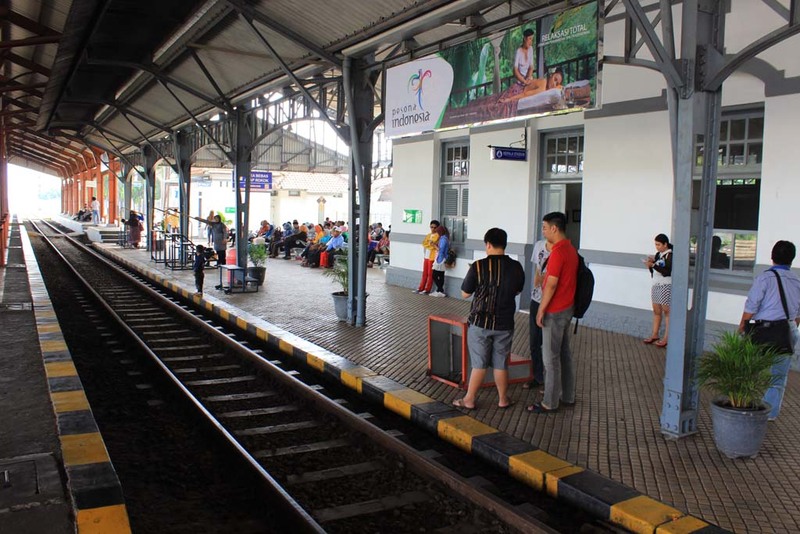 We stopped by at Sukoharjo station. 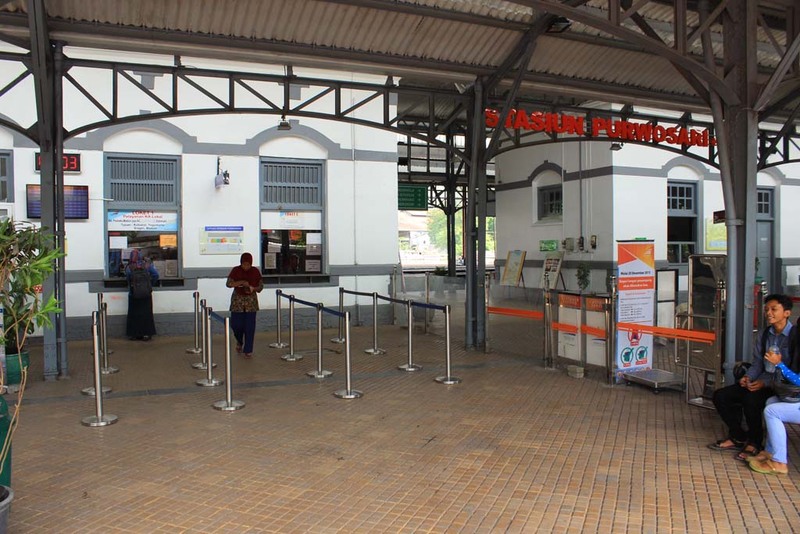 When this line was reopened in 2012 after some period of hiatus, the service terminated in here. 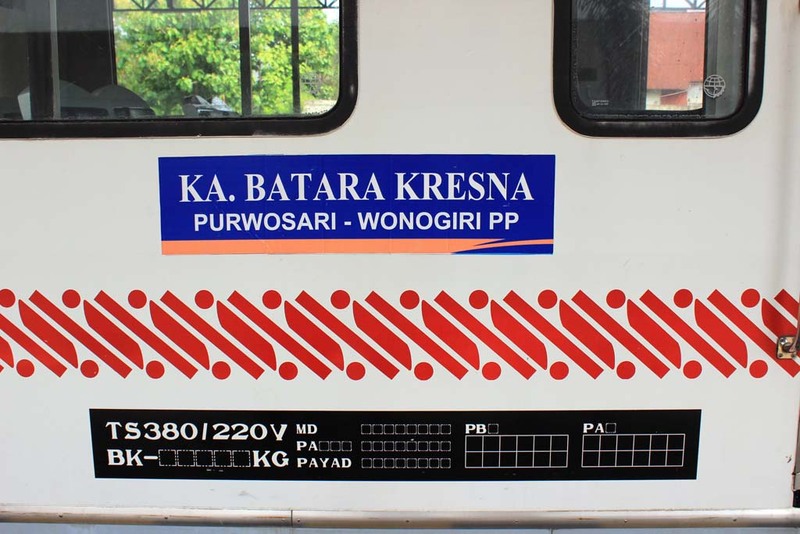 But it has since been re-extended further to Wonogiri. 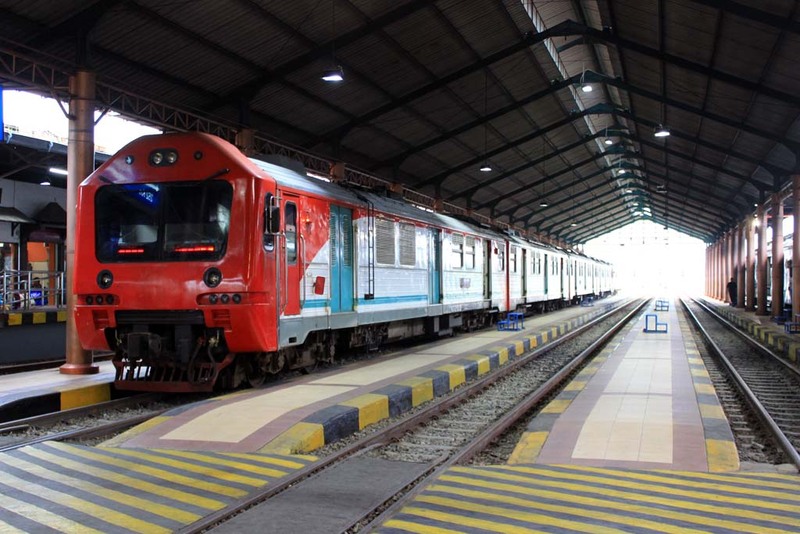 I remember when the last time I rode this train to here back in 2012, the train was brand new. The aircon worked. And of course there were no scratch marks at all on its exterior. After several minutes of stopping, we resumed our journey again. This is the first time I traversed this route since 2007. Back then I rode on the deck of a small shunter loco. 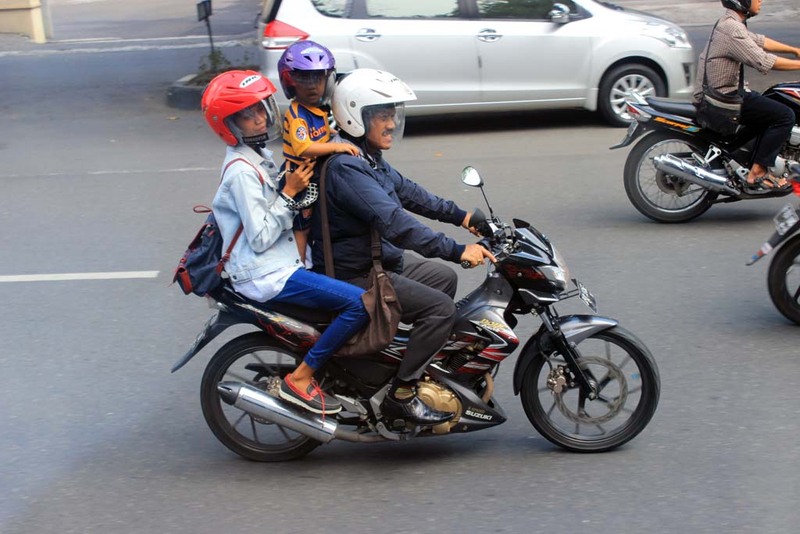 The kids were restless throughout the journey. Some even trying to play around with the trash bin. 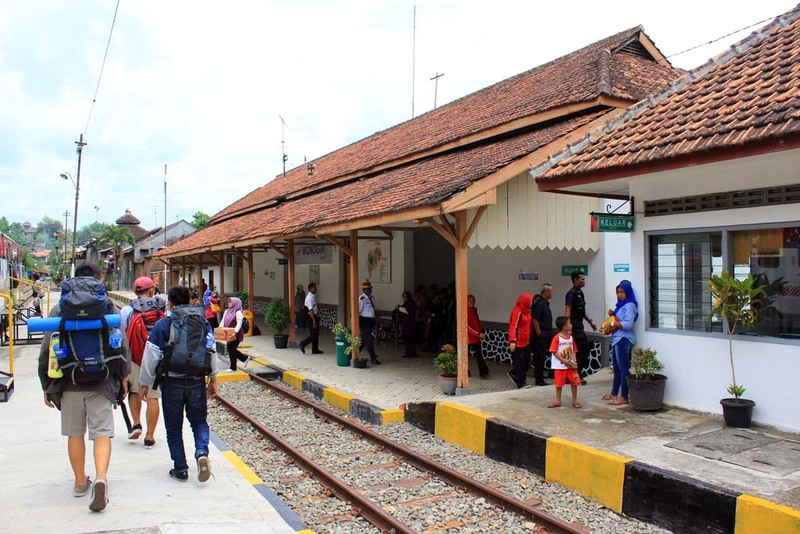 We later arrived at Pasarnguter station. The station also has a siding that goes to a storage warehouse. 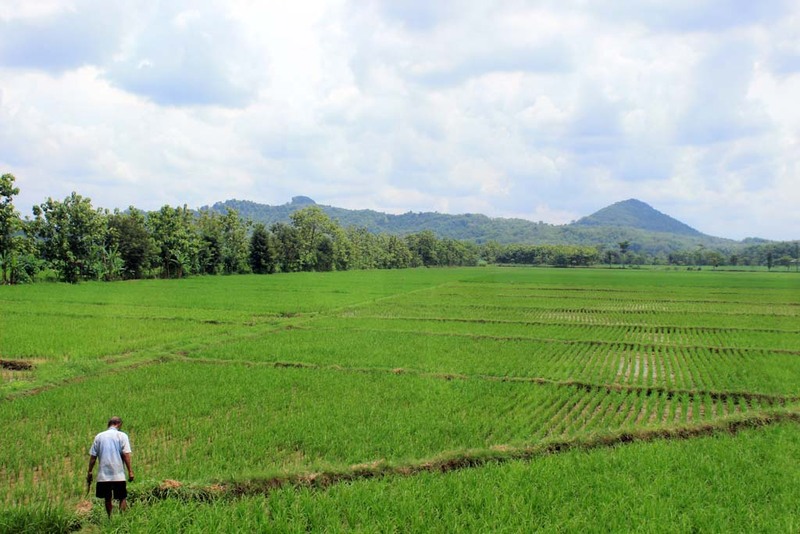 Back in the old days it was used to distribute fertilizer from Pupuk Sriwijaya Fertilizer Company. 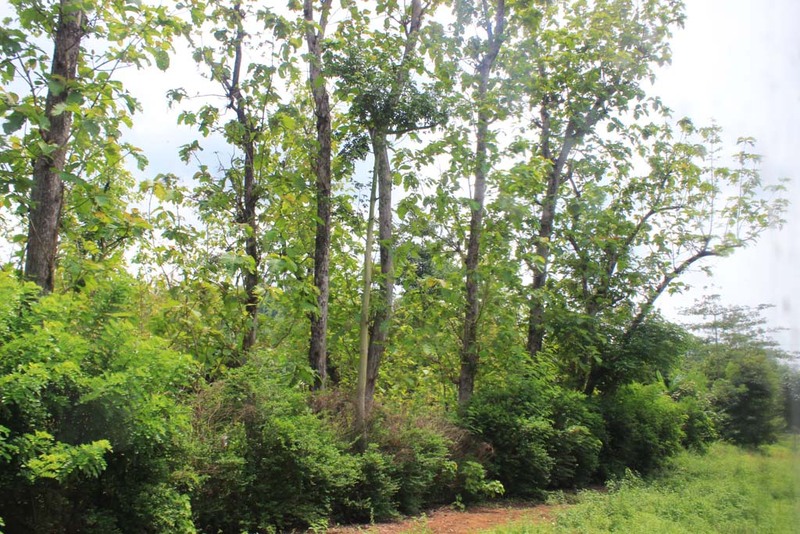 Although fertilizer traffic have ceased since 1990s, the siding is somehow retained. It’s quite a long wait at Pasarnguter, which is strange as our train is the only train that plying this branchline. The scenery near Pasarnguter station is unbelievably beautiful. 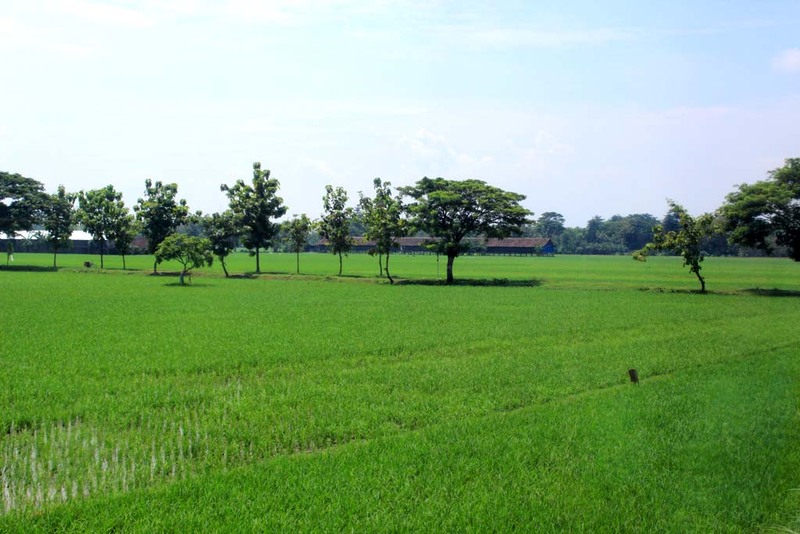 I even think passengers who waiting for the train in here wont get bored as they can enjoy the scenery of rice fields and rolling hills. 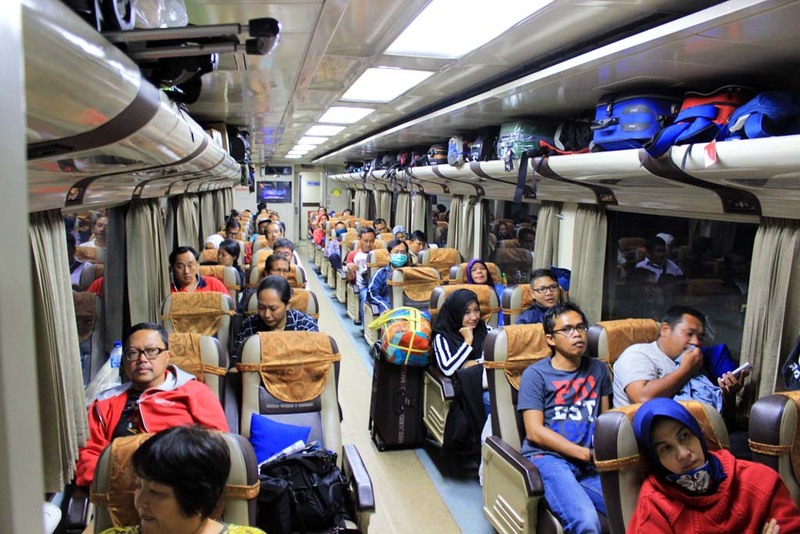 The kids are growing restless as the lousy air conditioner failed, makes the train’s cabin felt rather uncomfortable. 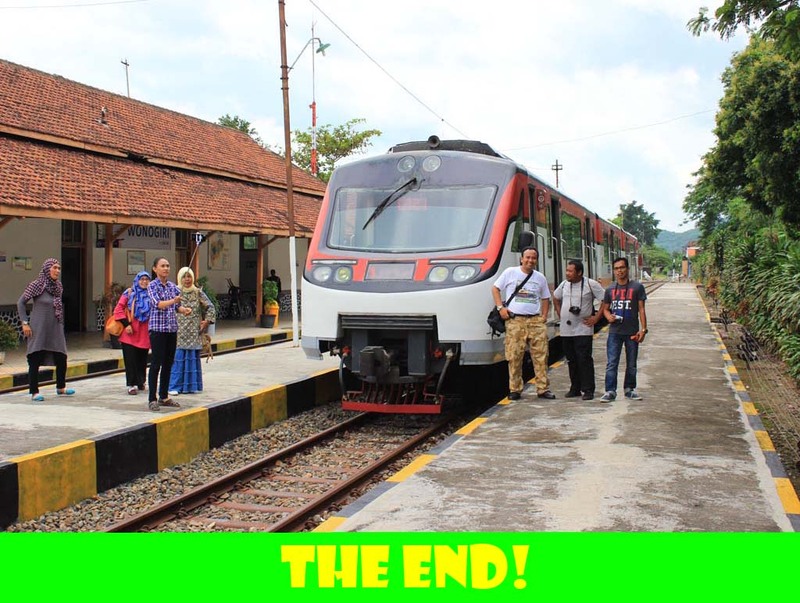 Thankfully, our waiting is finally over and our train is given clearance to go. 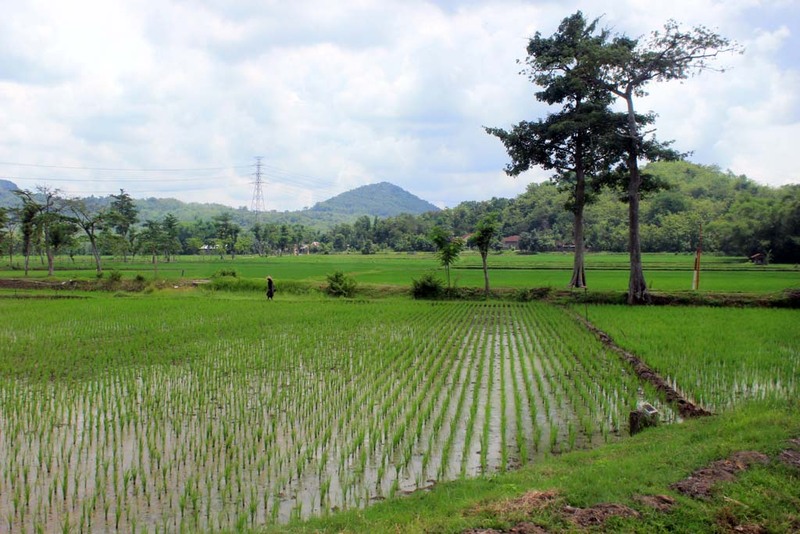 Beyond Pasarnguter, the terrain becomes increasingly hilly. 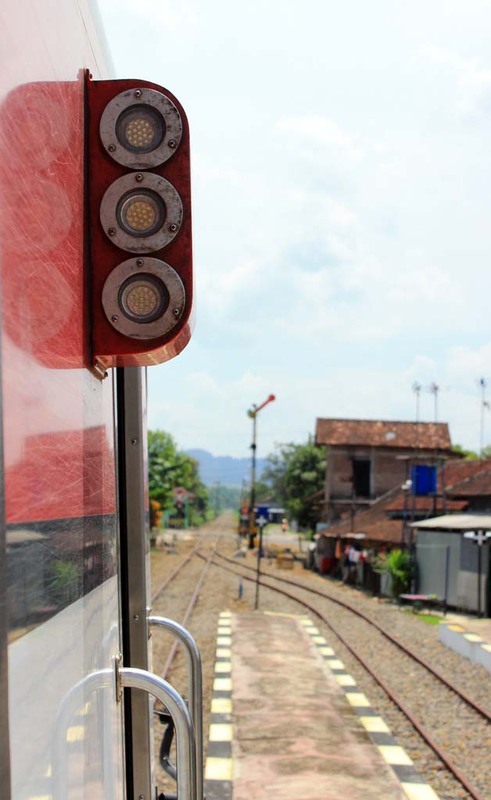 In fact as we approached Wonogiri, the driver revving up the train’s engine as we had to negotiate moderate gradient near Wonogiri. 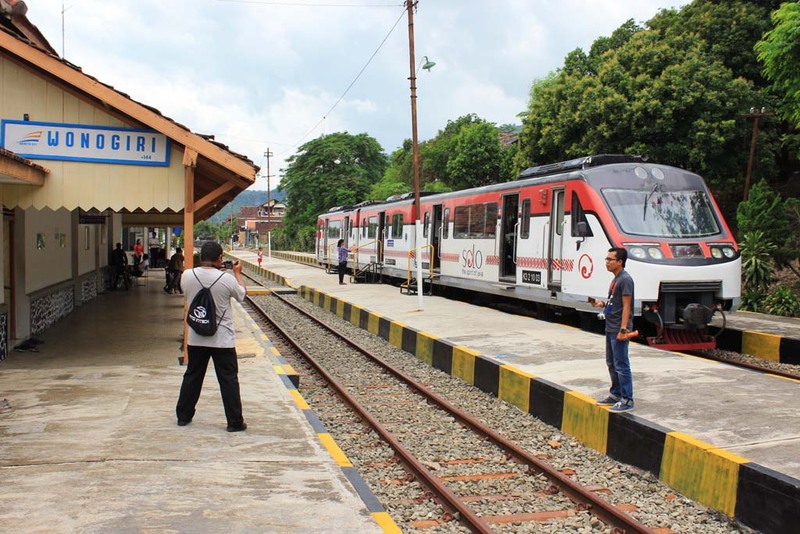 While the train is working hard, the passengers could see the beautiful teak forest scenery which encircled the town of Wonogiri. 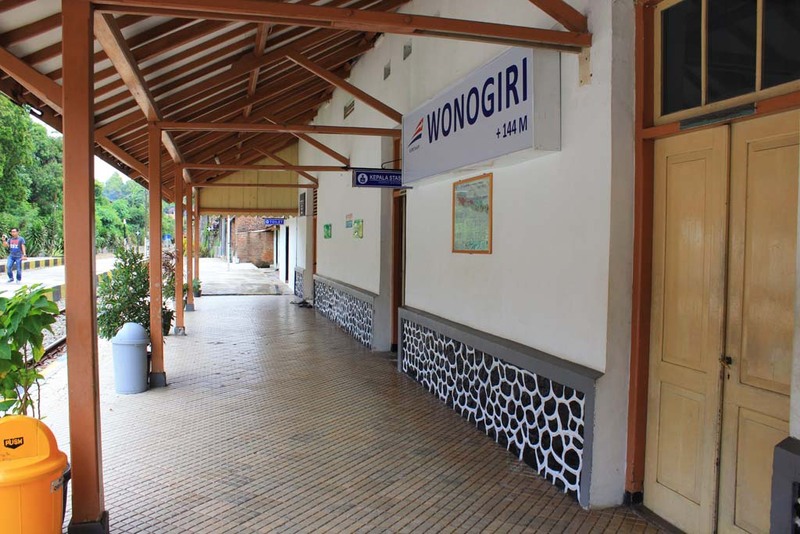 After several minutes, we finally arrived at Wonogiri station. 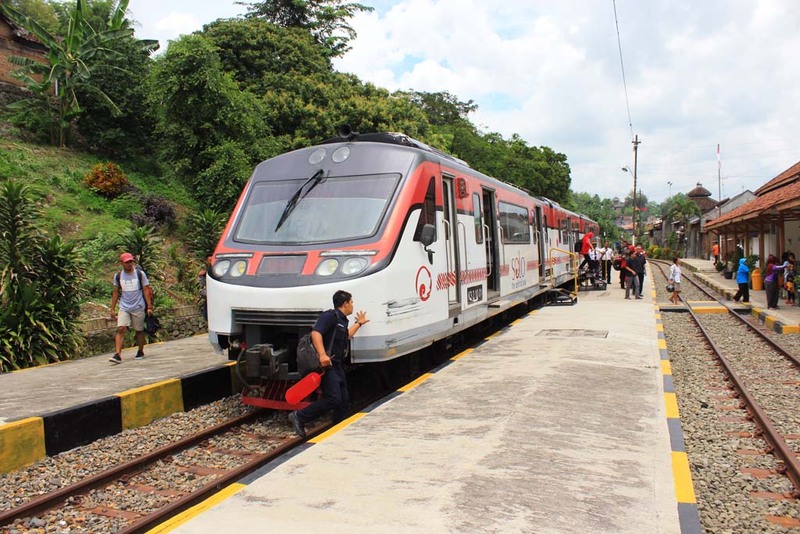 All passengers start to disembark from the train. 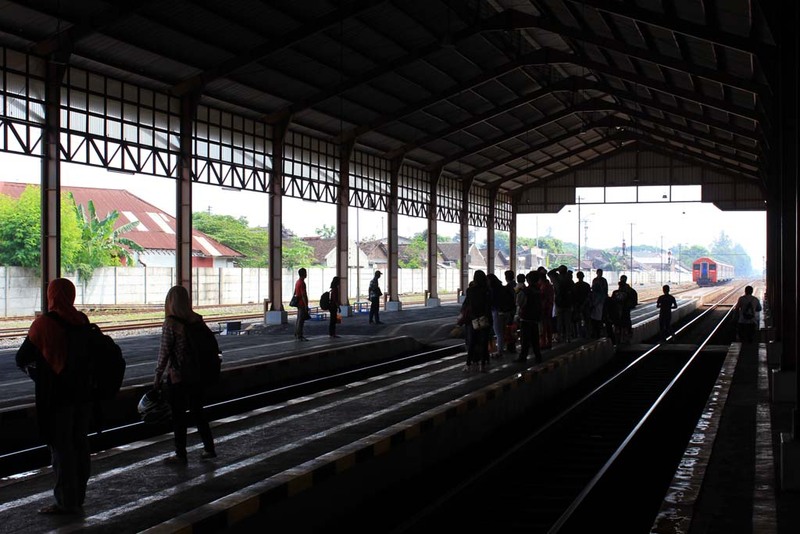 Meanwhile, there are another group of schoolchildren waiting in the station’s hall to board the train. 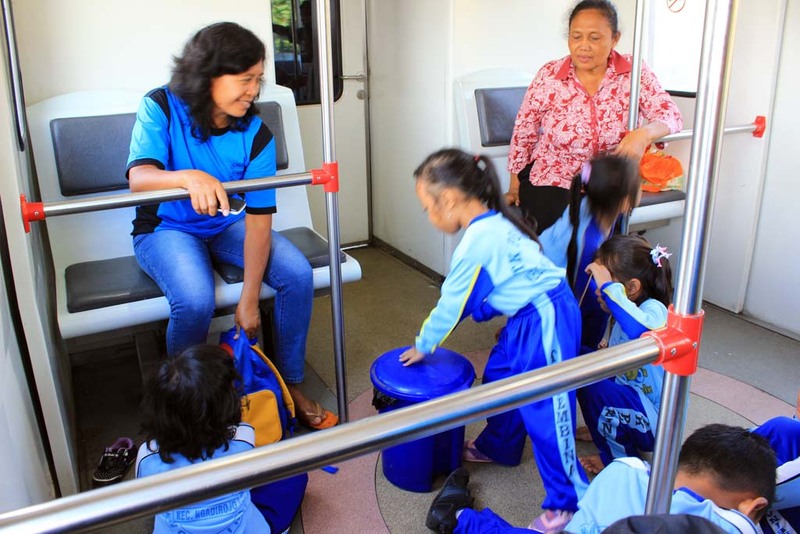 Once we exited the station, the schoolchildren from Wonogiri boarded the train, while the ones from Solo Kota boarded the bus whose are prepared in front of the station. 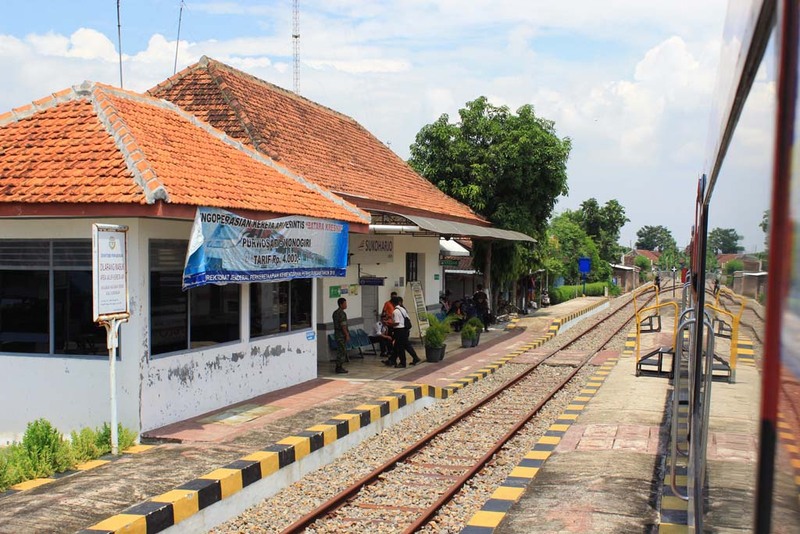 The small Wonogiri station is the current terminus of the branchline that started from Solo Purwosari station. Back in the old days, the railway lines used to go further to the south beyond this station, all the way until Baturetno station. 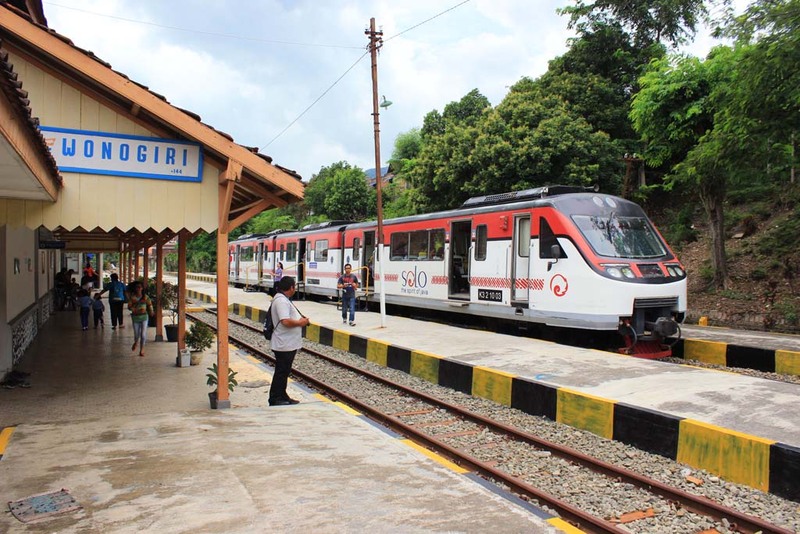 But the service to Baturetno was suspended in 1976 when the Gajahmungkur dam was constructed, as it flooded a significant portion of the railway track. 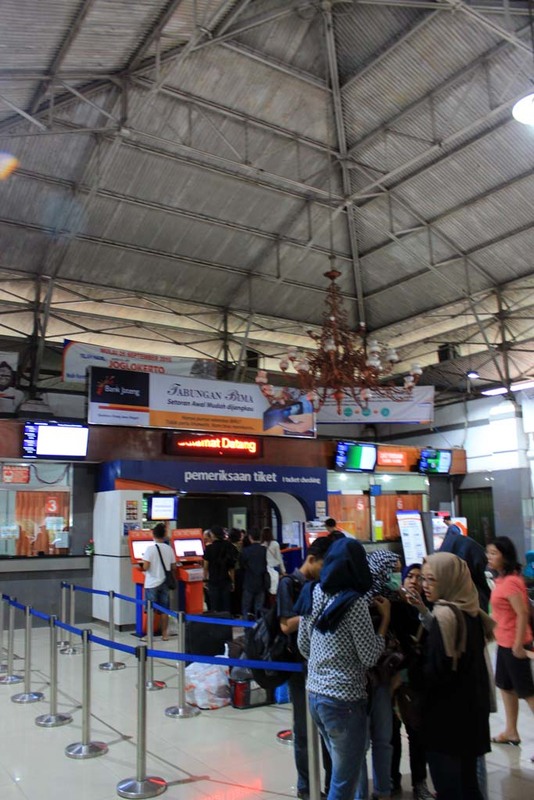 I soon bought the return ticket back to Solo, although there are plenty of tickets, there were no seats available. Soon we return back again to the platform area. 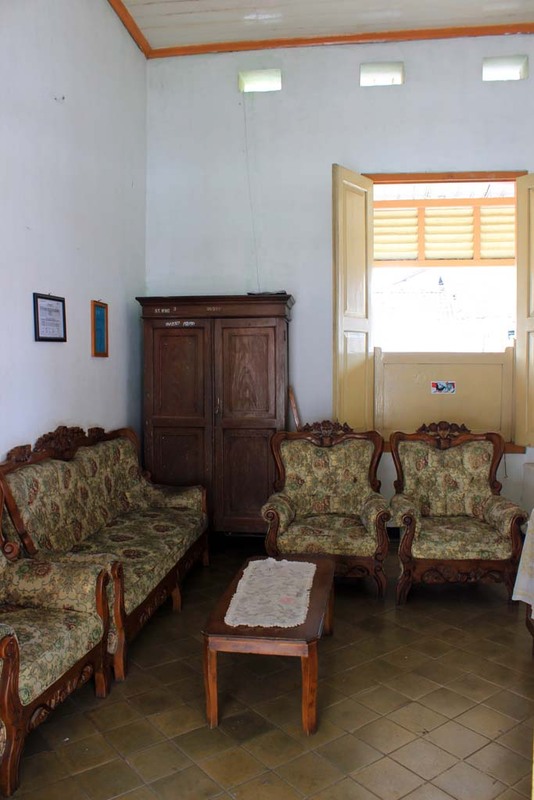 Although heavily modernized, Wonogiri station still retain the elements of the old building, including this classic looking guest room, complete with the old tiles! 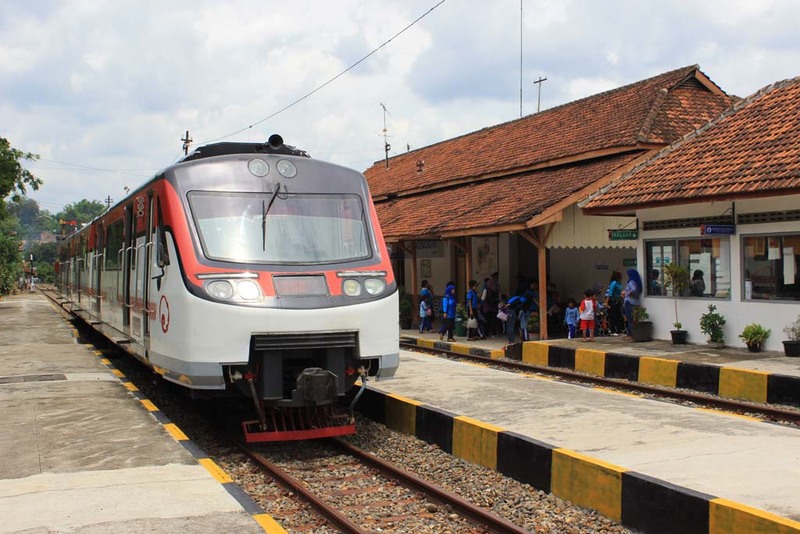 It’s quite an unique thing to see modern looking Batara Kresna DMU parked in front of classic looking Wonogiri station building. Since we had an ample of time before our departure, we spend it by taking pictures. Our train finally departs around midday. 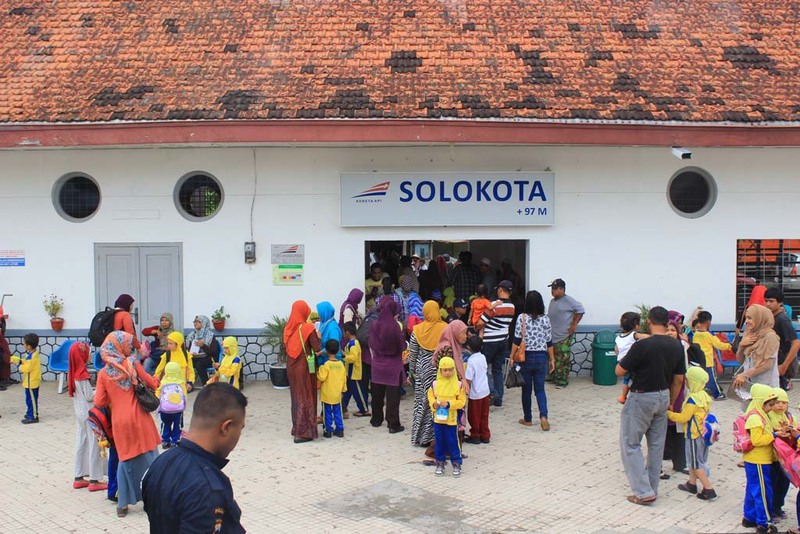 Unfortunately, since it is already packed with schoolchildren, we had no choice but to stood up throughout the journey back to Solo. I initially stood on the cab car. 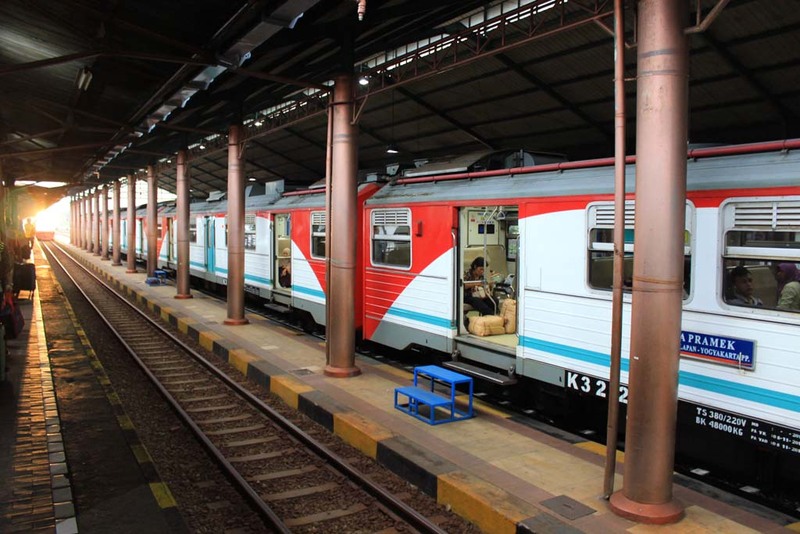 But since it is hot, I decided to move to the middle car where the aircon turned out to be in proper working condition! 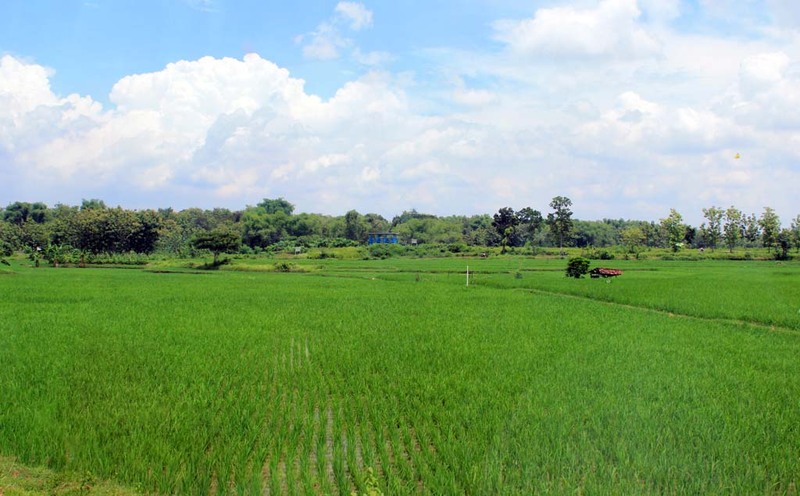 I didn’t take much photos between Wonogiri to Solo Kota. But I did take some video clips along the way. 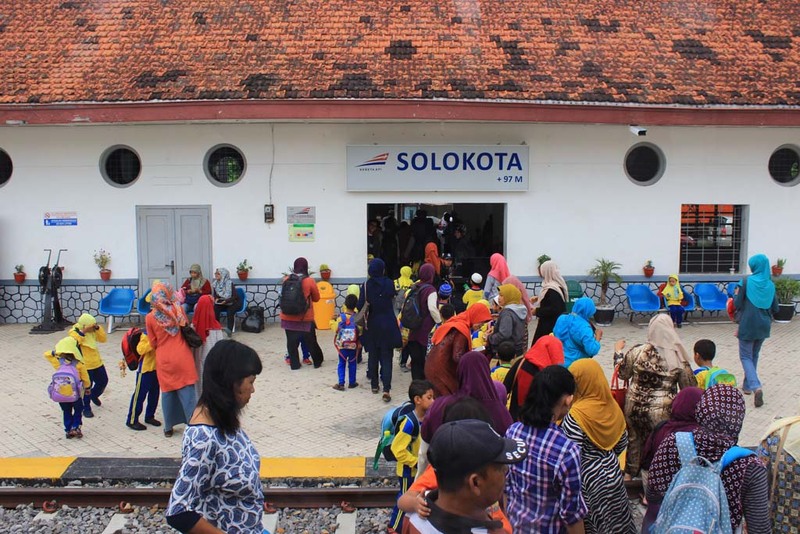 Once our train arrived at Solo Kota, all of the schoolchildren and their teachers disembark from the train. Leaving a plenty of seats for us! 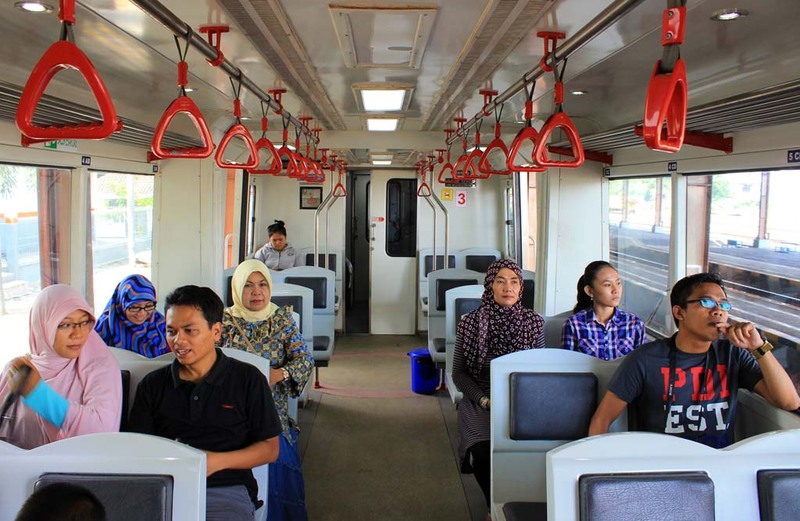 I also notice that some of the passengers have Arabic looking appearance. 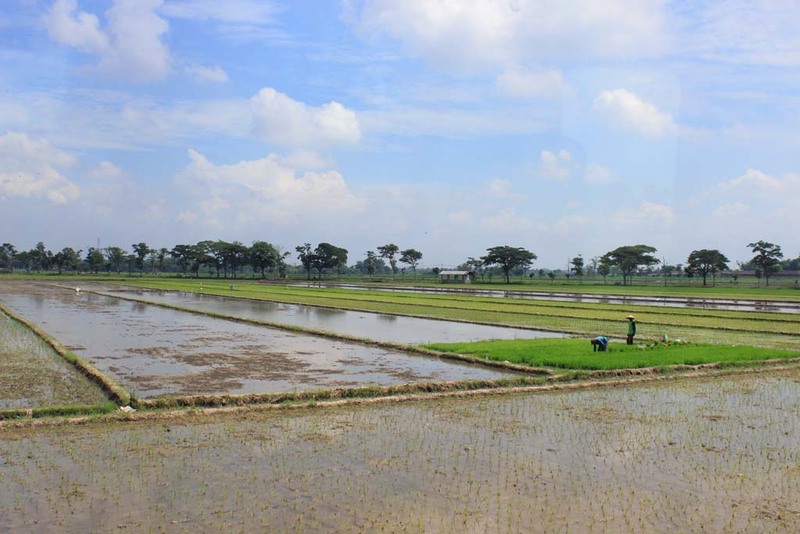 It is understandable as Solo have sizeable amount of Arab Indonesian community. The return journey through the street running section went uneventful. 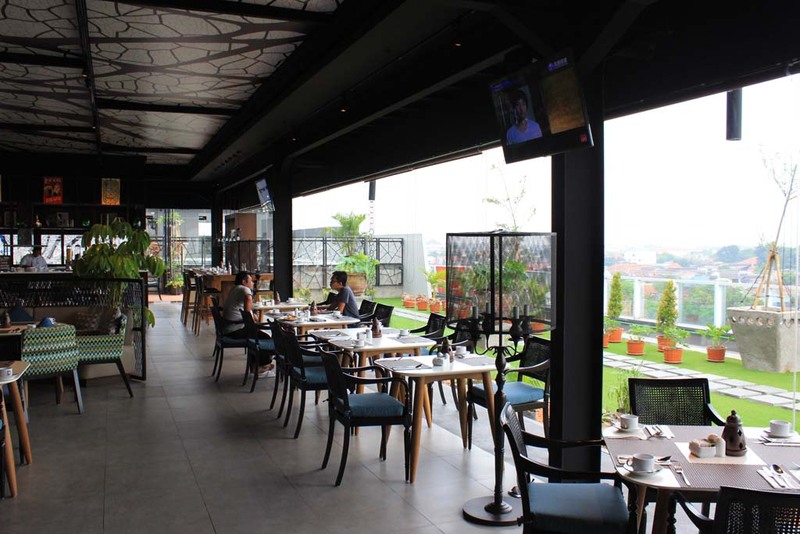 One of the hotel that we passed is this Novotel Solo. 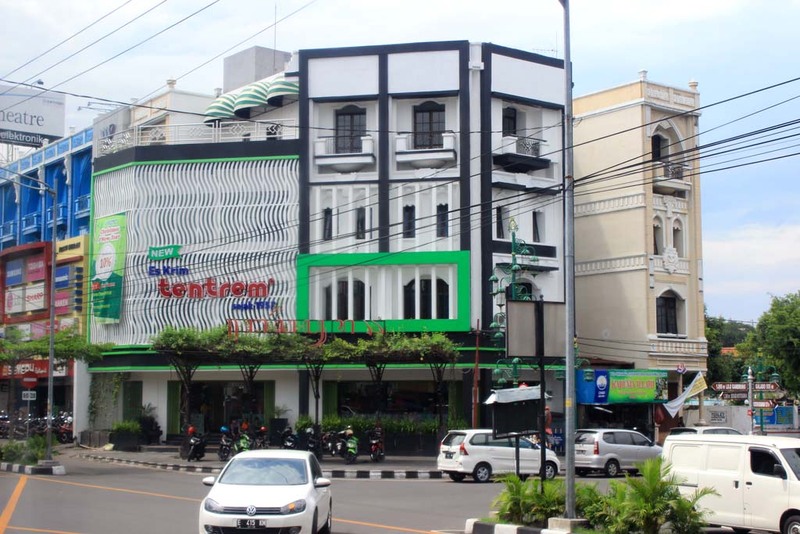 It is one of the earliest 4-star hotel in Solo, and it has been around when Solo was smaller than what it is now. Now this hotel has many rivals. Upon returning back to the hotel, we fetch our bag and called the taxi. While waiting for the taxi, my local friend from Karanganyar, Ariawan Sulistya came to our hotel. Well, it is good that we can eventually met. We chat a lot while waiting for the taxi. 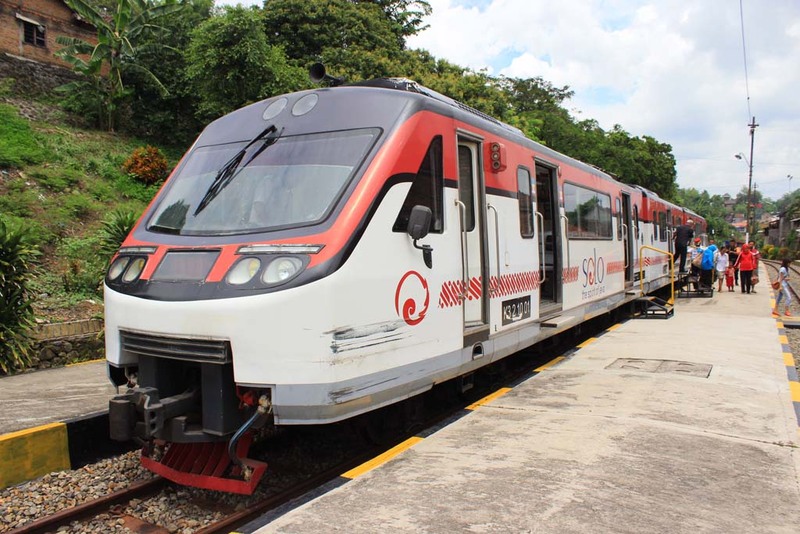 He also mentioned about several railway activities around Solo, including the ones at Tasikmadu sugar mill. 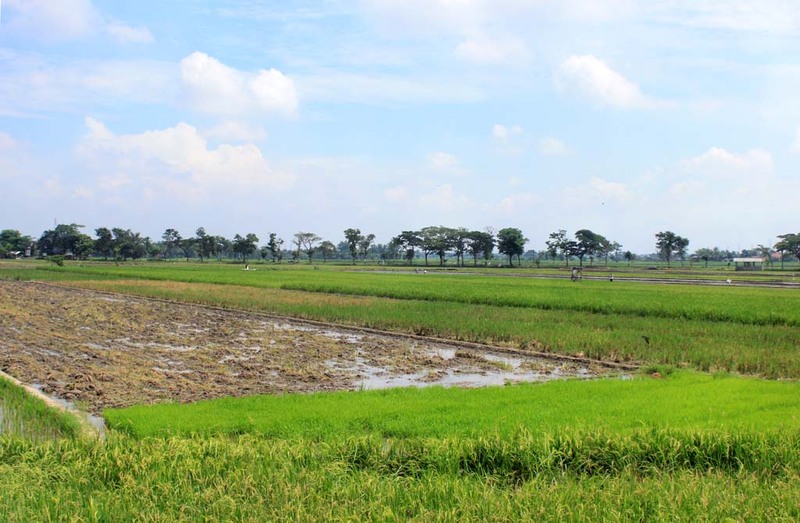 Once our taxi arrived, we bid farewell to Ariawan and resuming the journey. It was lunchtime, and we felt hungry. 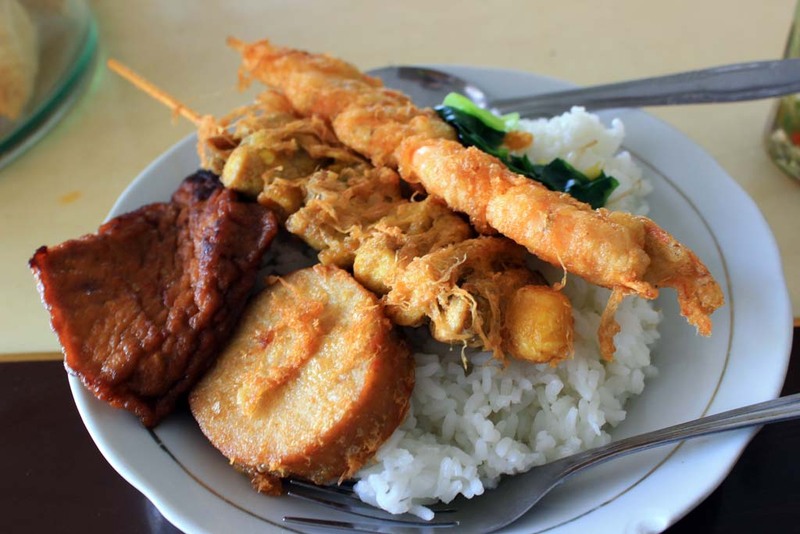 I asked suggestion from the driver about good and affordable restaurant around Solo. 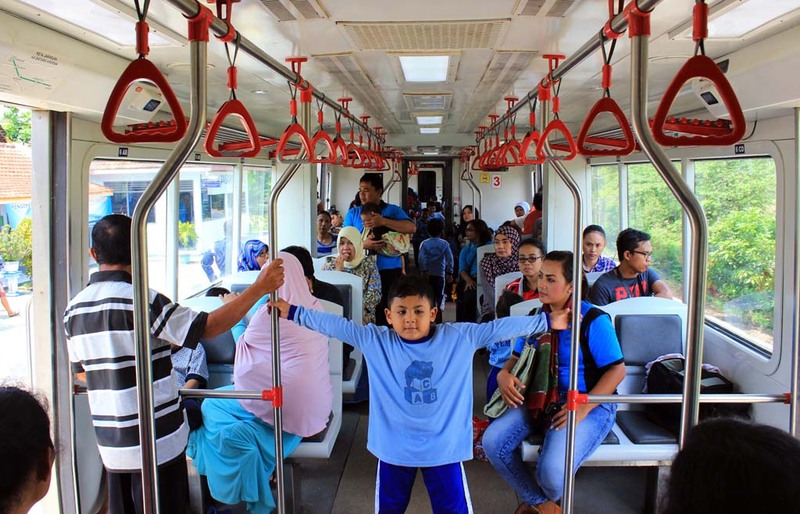 He suggesting Taman Sari, which is located on the main road to the airport. 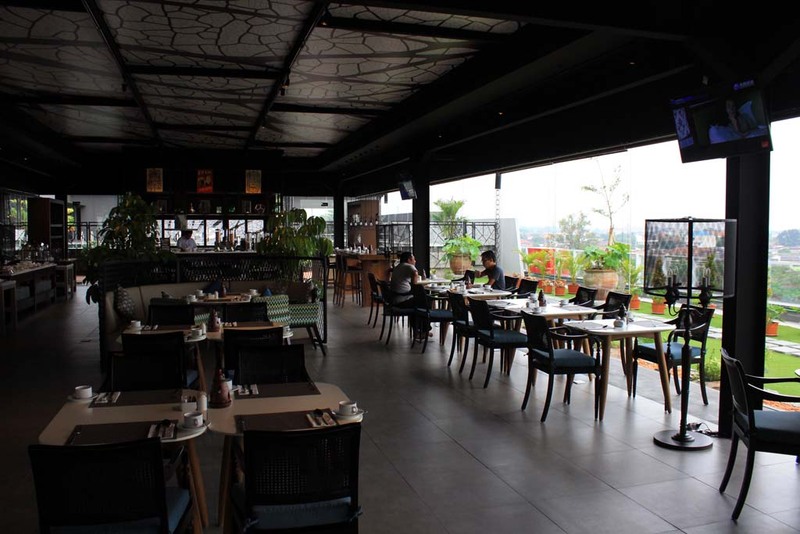 The food are good, and the price is also reasonable. I ordered rice with shrimp satay, chicken rollade, and spiced tofu. And for the drinks, I take “Dawet”, a traditional sweet drinks made from coconut sugar and jellies made from rice flour. After we finished our lunch, we head straight to the station. 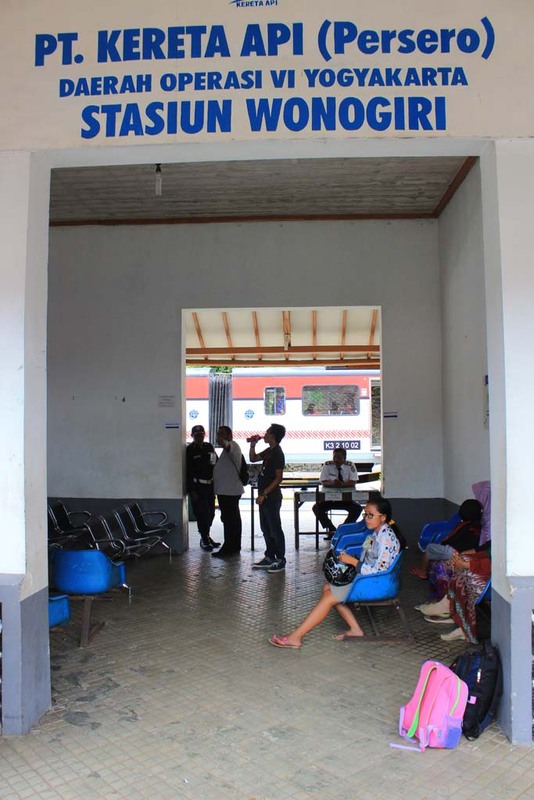 It might still be long, but we think it would have been better if we wait at the station, rather than rushing ourselves later on. The main hall looks slightly busy. This Dutch era building is still perfectly maintained despite of decades of usage. 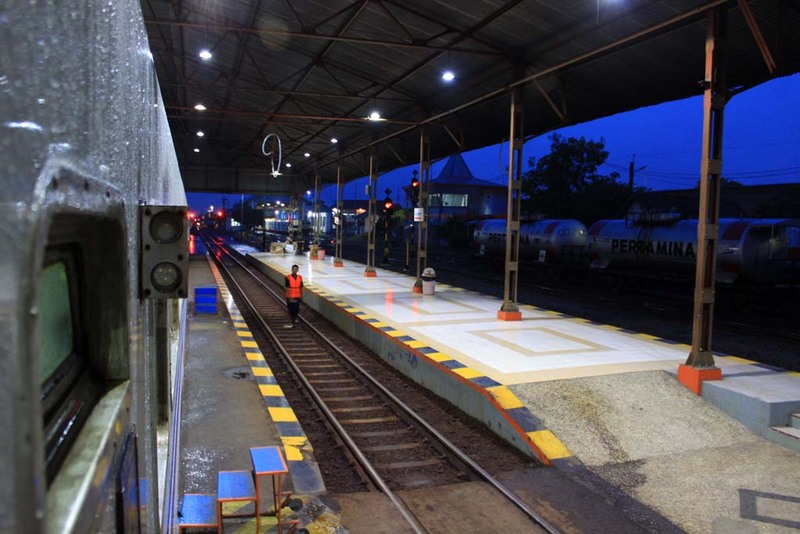 Before entering the platform, we decided to have some coffee at one of the Rotiboy outlet in the station. We concluded our today’s journey is a successful one. Admittedly, it could have been better had the train traveled faster. 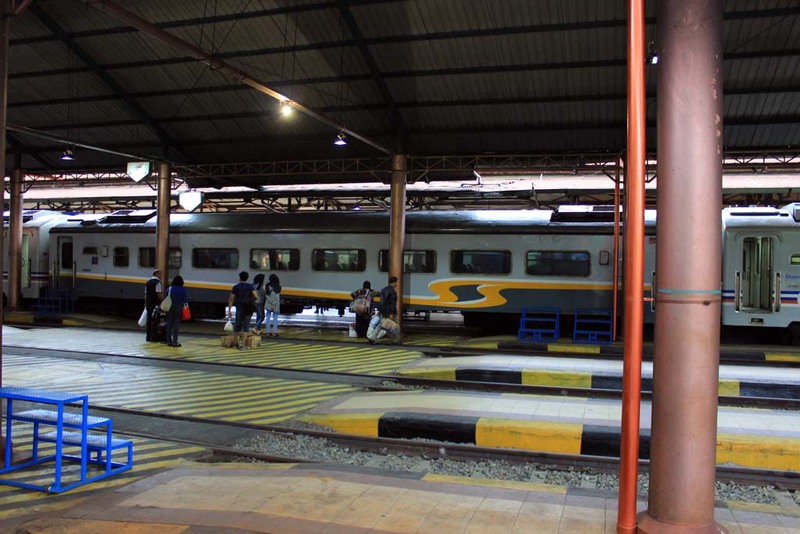 As our departure time nears, we decided to enter the platform. 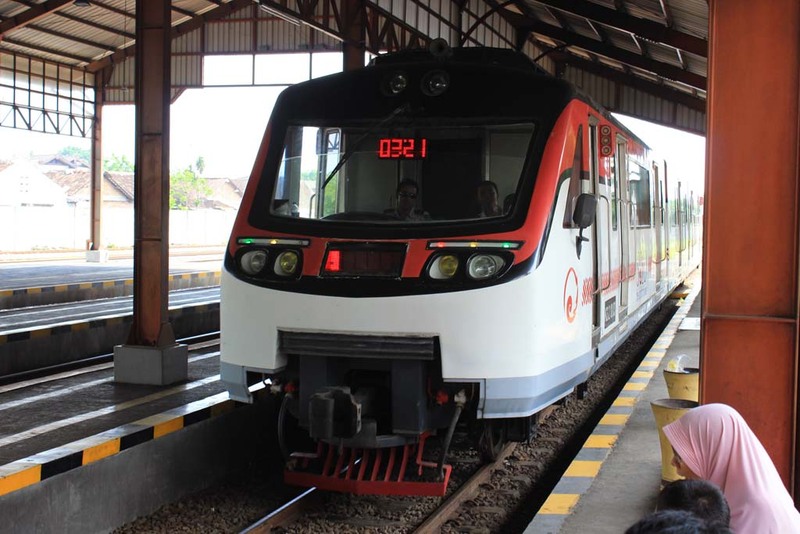 Inside, there is a Prambanan Express train waiting in the station. It stopped for quite a long time, apparently waiting until its new schedule to commence. 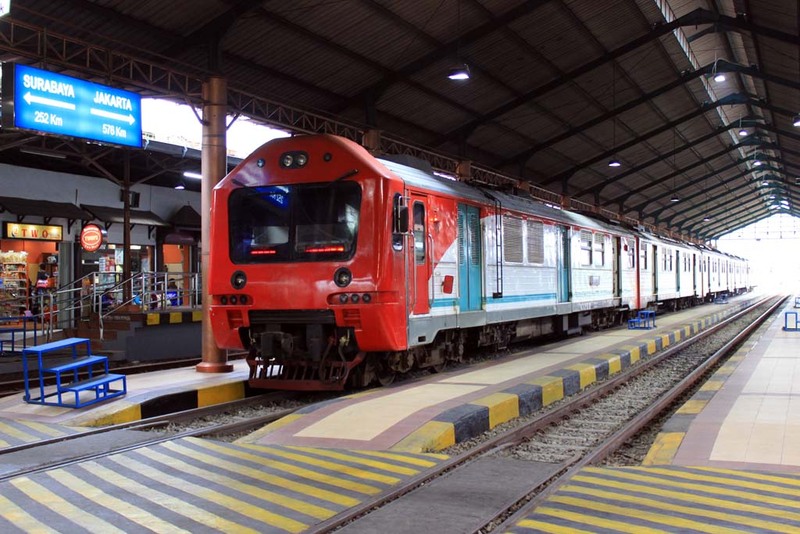 A few minutes later, the Lodaya train from Bandung arrived at the station. This train terminates here. 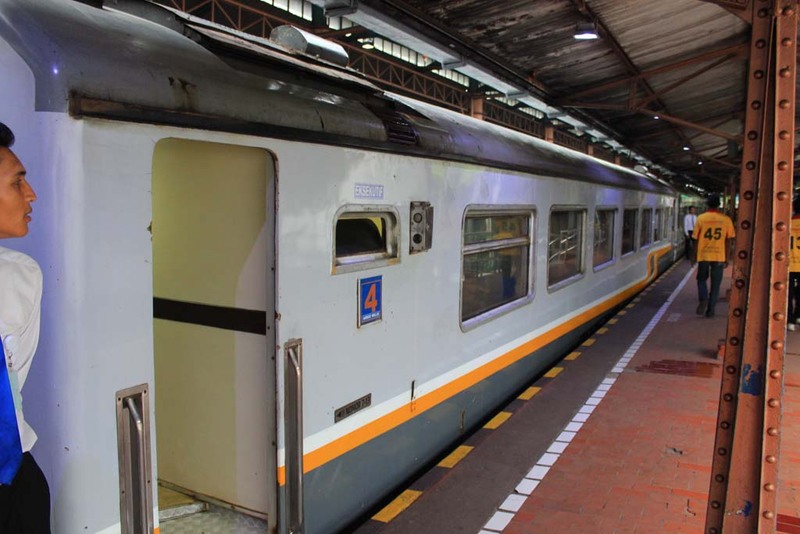 But what surprised me is the fact that some of the carriages are formerly used by legendary express trains of the past. 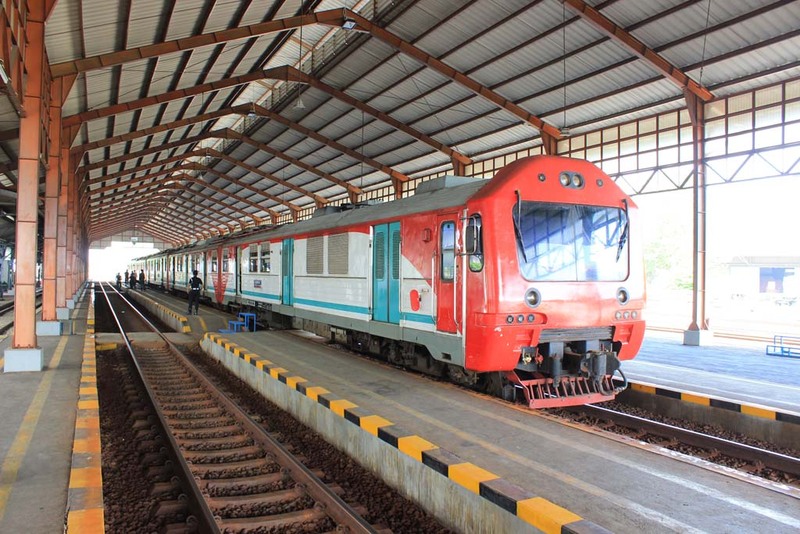 And then this coach which is amongst the very first air conditioned seater trains originally used on Mutiara Utara express train. 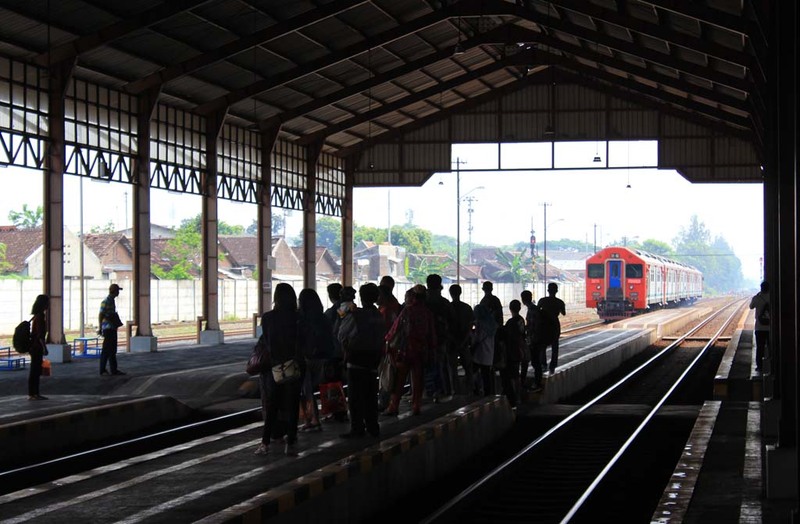 Not long after that, our train arrived from Bandung. 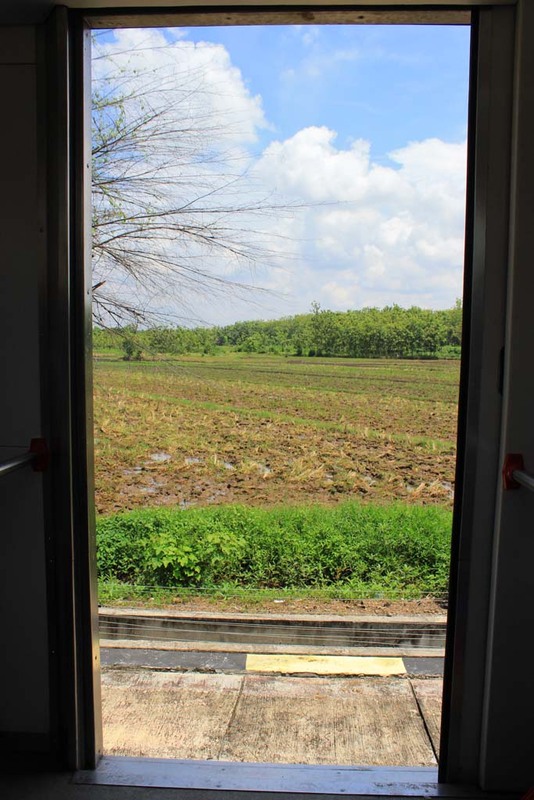 As soon as it came to a halt, we boarded our train. It’s quite a busy period now. Before I boarded the train, I was surprised when I see this. Back in the old days, you could go to the VIP lounge from here. 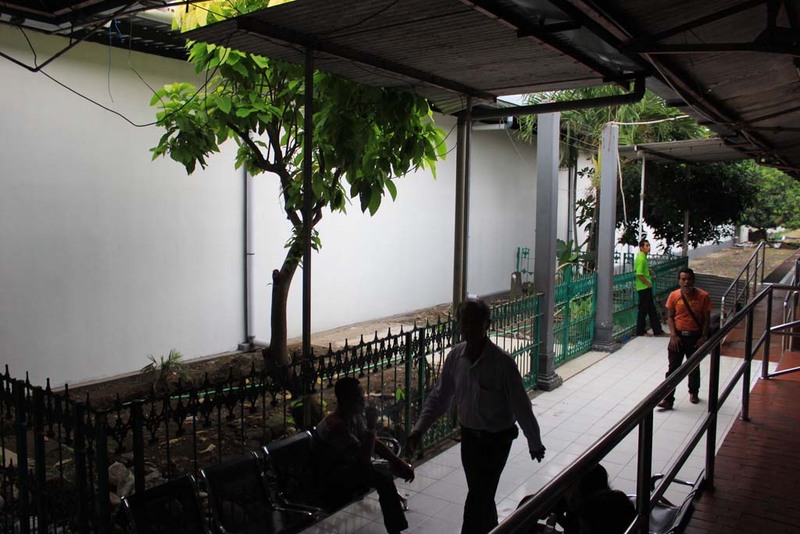 The lounge is still there, but the access path to the platform have been walled. Our train is really packed today. 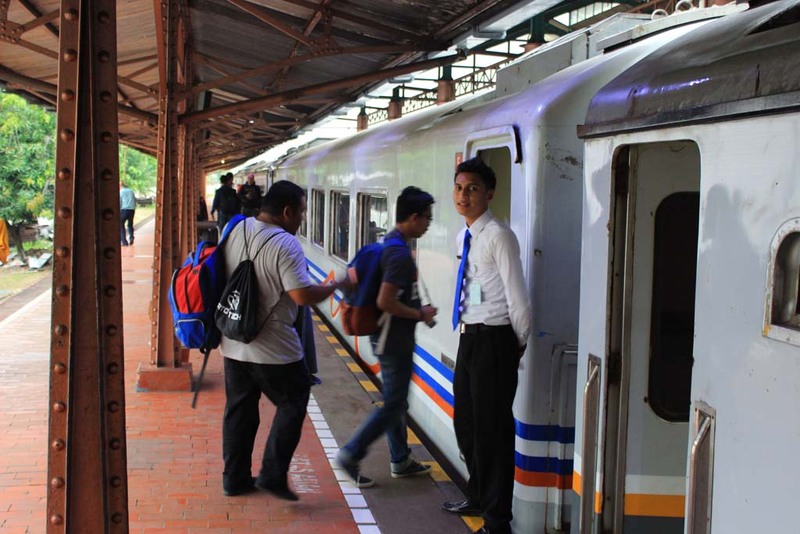 And most of the passengers have boarded the train all the way from Bandung. 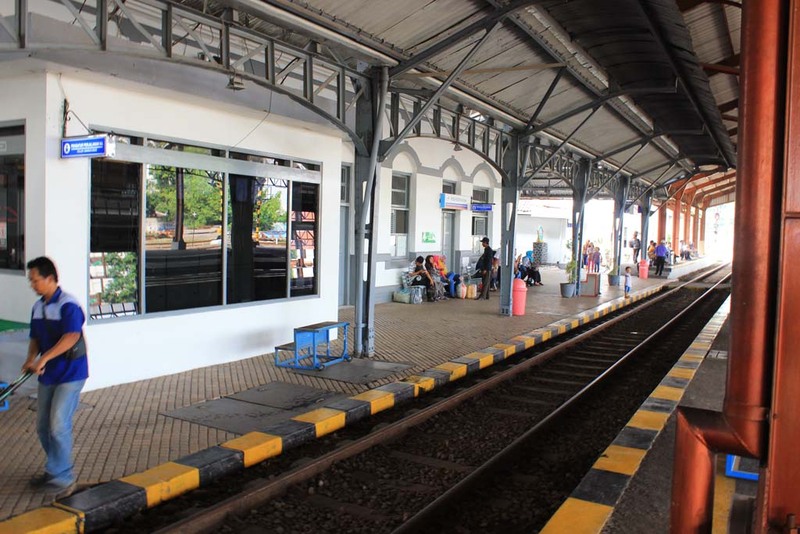 Once the train departs Solo, I sat and tries to relax myself. I have to say that Argo Wilis seemed to be a shadow of its former self. It is not as comfortable as it used to be, since they decided the replace floor material from carpet into vinyl. Even the seats are now wrapped in synthetic leather. If that’s not enough, these days they decided to put the light in the middle, making the interior too bright and uncomfortable for night trip. 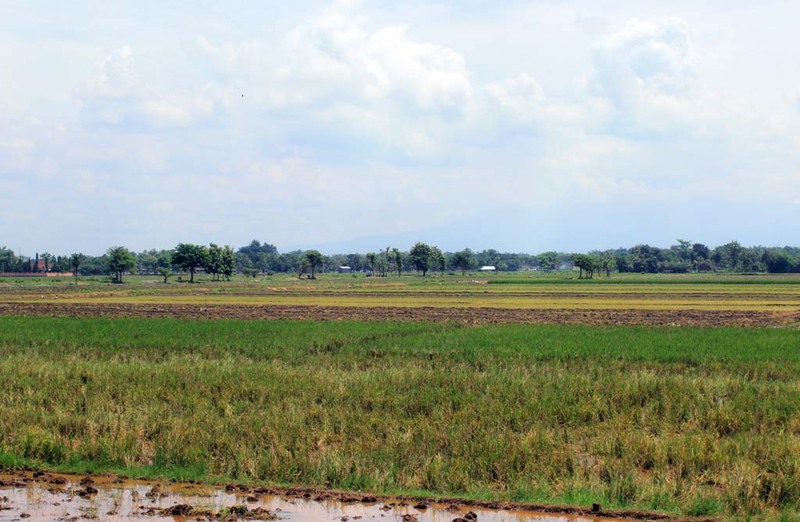 The sky is getting darker as we arrived at Madiun. 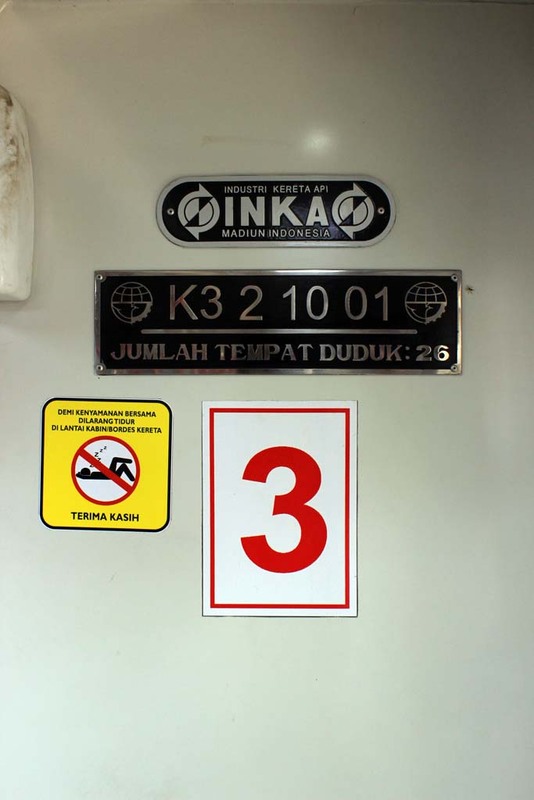 Waktong and Hafizul are curious about INKA plant, as Malaysia have recently commence the operation of INKA built coaches. I tried to show them but they’re partly blocked by petrol tank cars. 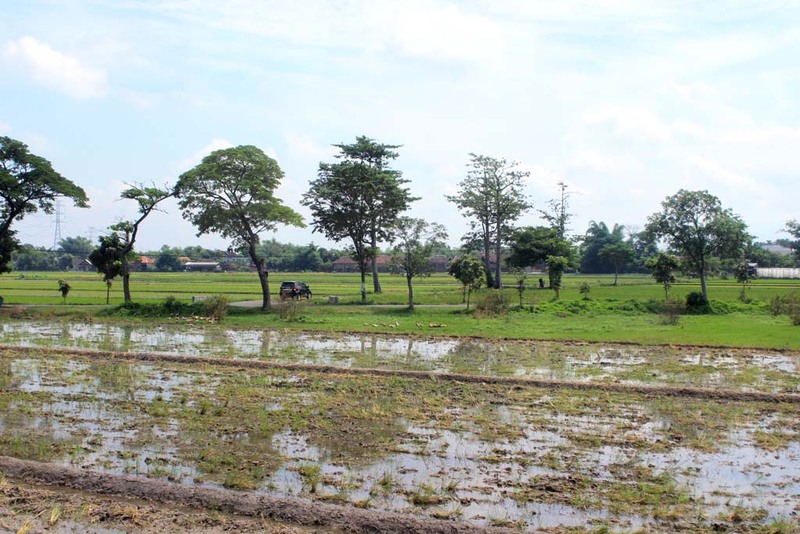 The remainder of the journey went uneventful, before we finally arrive back at Surabaya at 9pm. My brother picked us up, where we took Hafizul and Waktong to their hotel, and then I returned back home to rest. 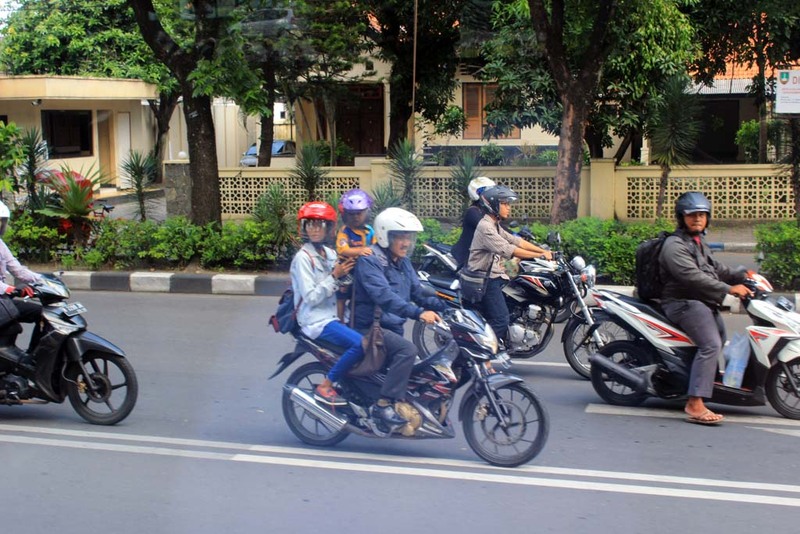 It’s Tuesday, and it is business as usual in Surabaya. But it is also the last day for our tour. 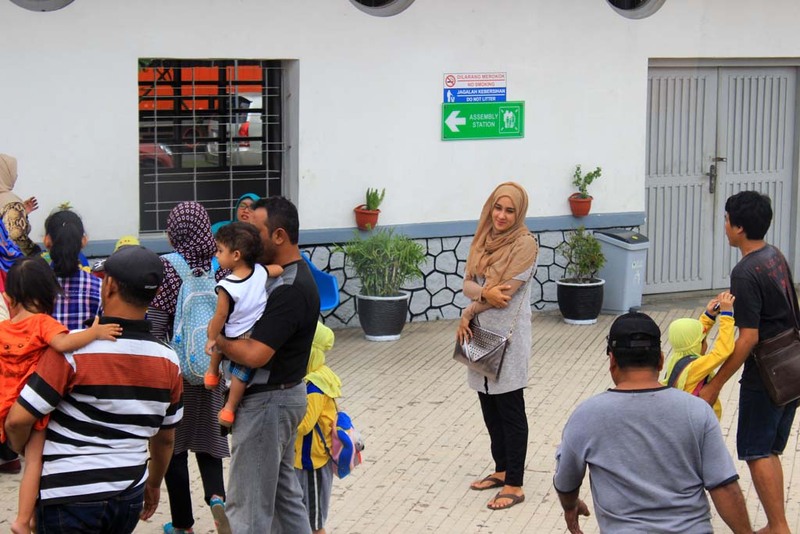 Waktong and Hafizul will catch their return flight to Malaysia in the afternoon. 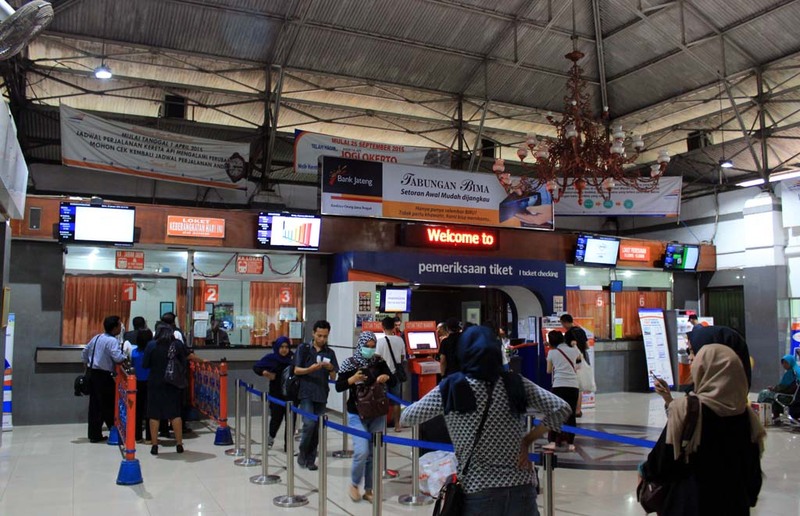 Waktong wants to buy some souvenir which is typical of Surabaya. 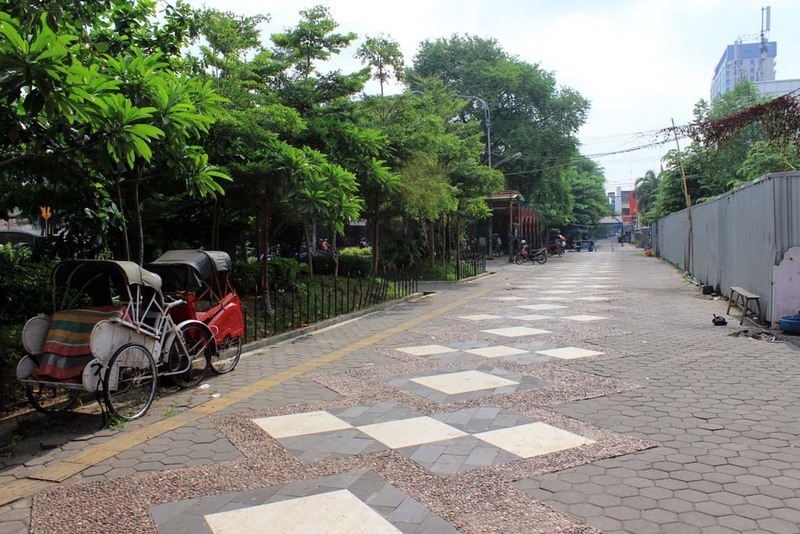 Since the number of souvenir shop in Surabaya are scarce and tricky, we decided to check out around 10 and head to some places to find souvenirs. After traveling around the city, we eventually get our souvenirs in a shop at the southern part of Surabaya. Once they purchased the souvenirs, we head for lunch. 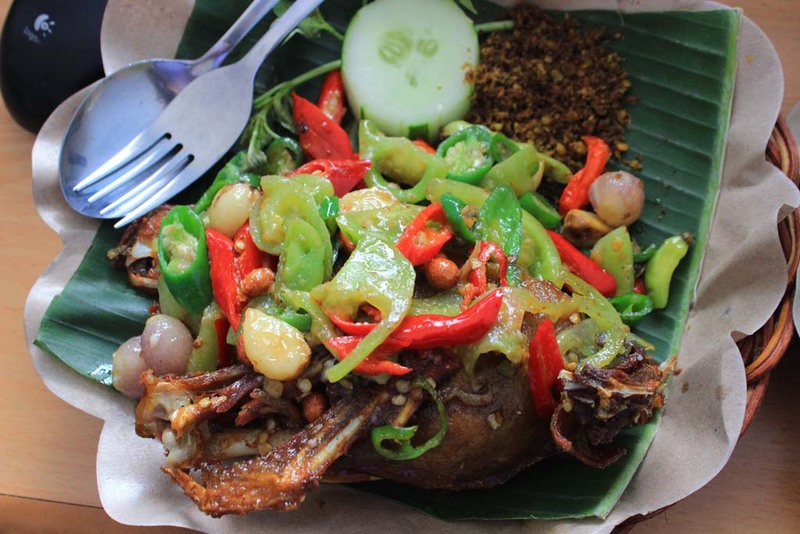 Since Hafizul is craving for another Bebek Putri Madura, we head to Bebek Harissa restaurant. 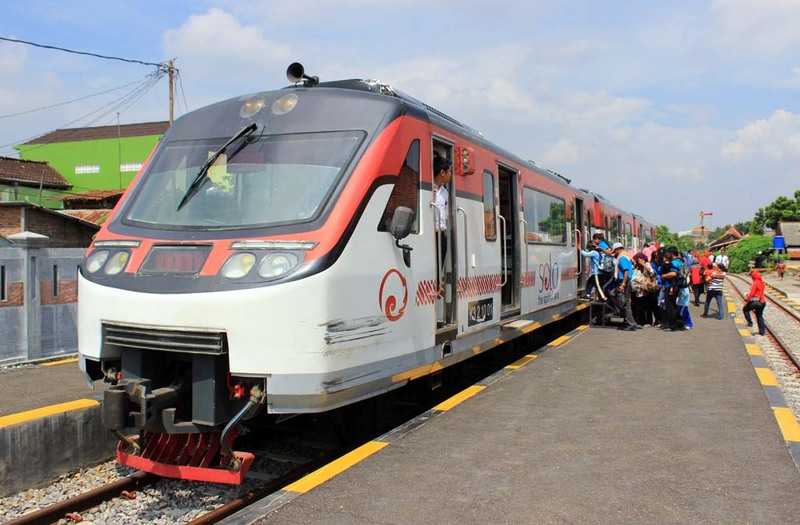 I initially wants to take them to the one near the railway line at Surabaya Expo. But since we had very little time left, I decided to take them to the one in MERR nearby. 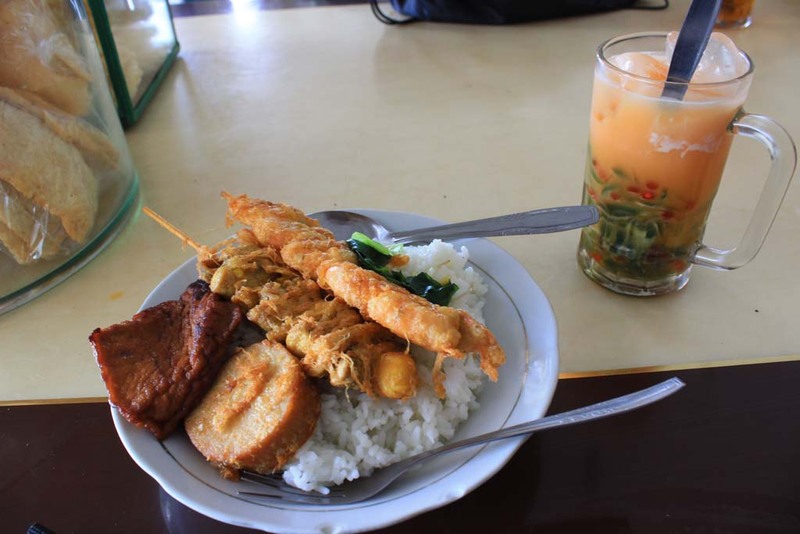 Of course we ordered Bebek Putri Madura. Very tasty indeed! After we finished our lunch and settling the bill we head to the airport. In there, I bade them farewell, and after 6 days of adventure, we eventually came to the conclusion of our tour. Everyone are happy and satisfied with the tour. Both of them promised that they will return back to Indonesia again to have another tour!